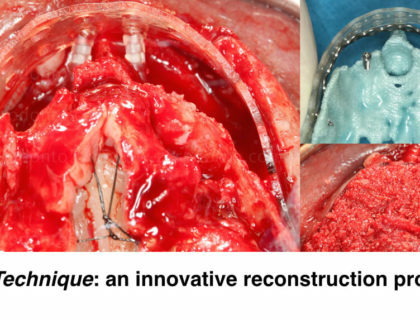 AN INNOVATIVE APPROACH TO GUIDED BONE REGENERATION. 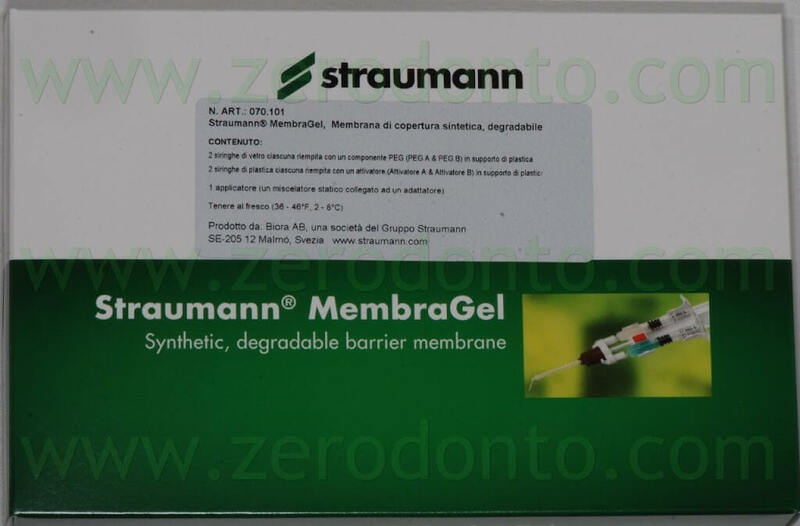 The Straumann® Membragel™ is a technologically advanced resorbable membrane that simplifies the clinical procedures of guided bone regeneration (GBR). 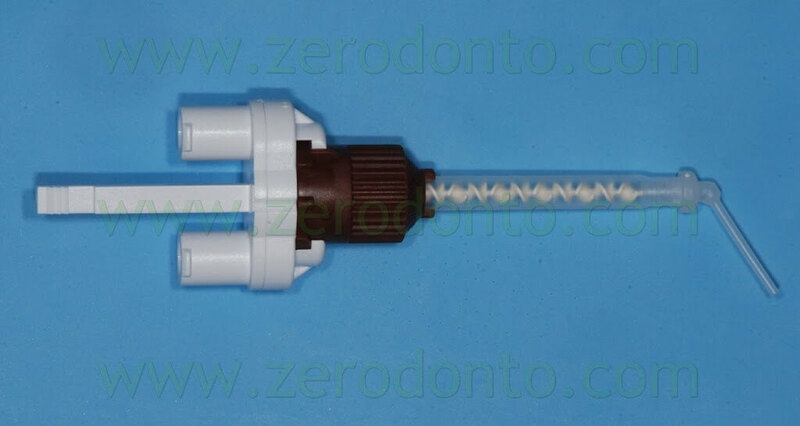 The application of the liquid membrane is very easy, fast and accurate. 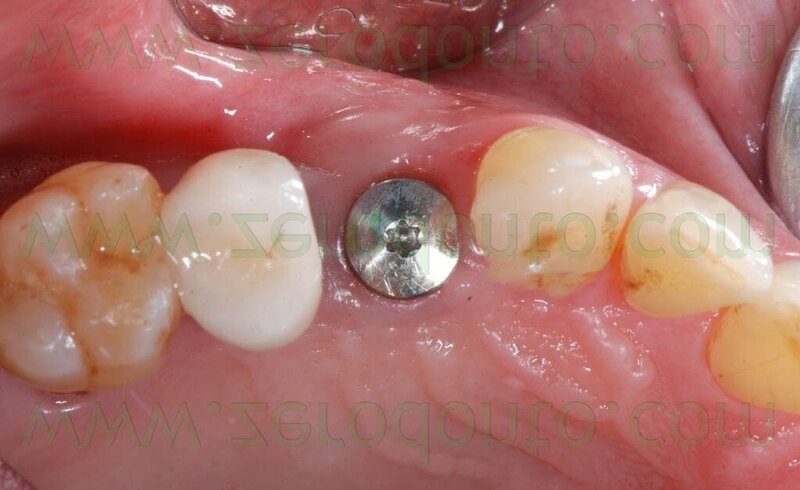 Once it solidifies, the Membragel stabilizes the bone graft material, acting as a barrier for 4-6 months before its resorption. 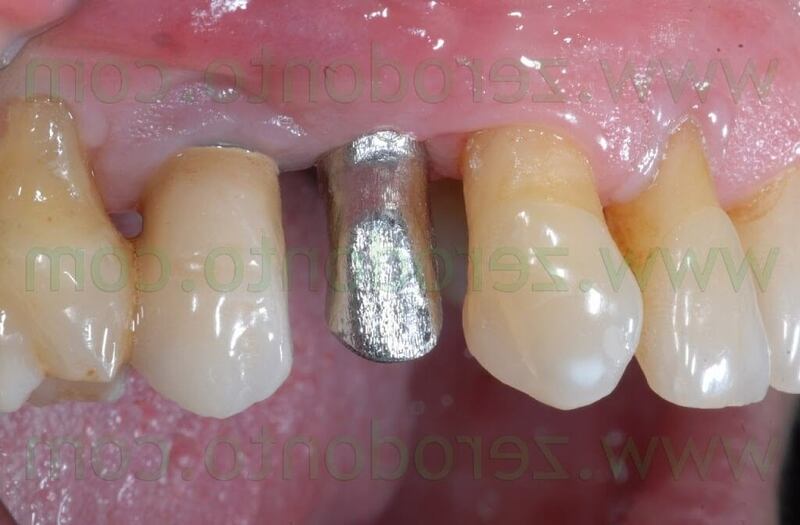 Preclinical data showed that the Membragel is resorbed significantly more slowly than conventional collagen membranes, offering an excellent biocompatibility to surrounding tissues. 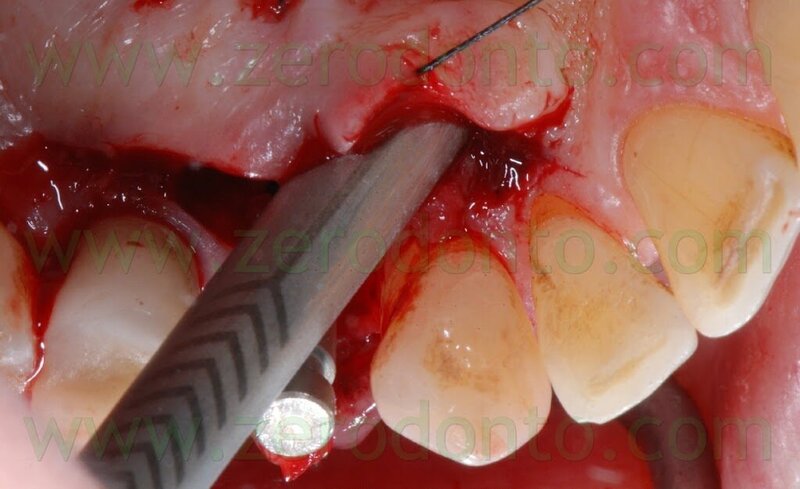 Due to its gel consistency, it can be placed accurately onto the bone defect, over the graft material. 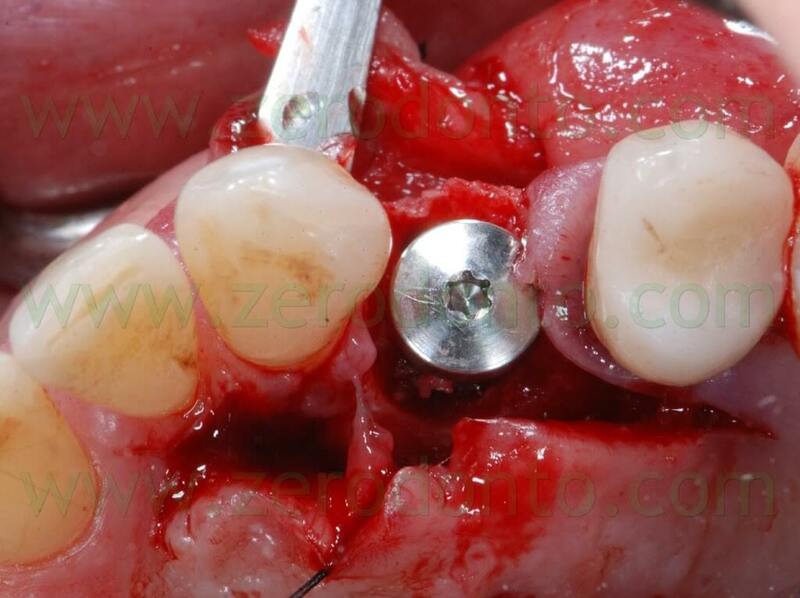 In order to stabilize the liquid membrane, it is sufficient to extend it 1-2 mm beyond the margins of the bone defect. 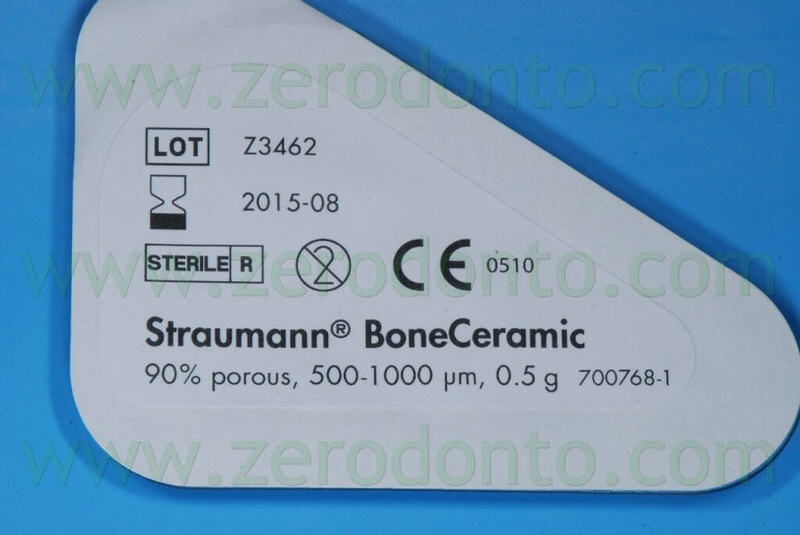 The use of the Straumann® Membragel™ allows for the formation of as much regenerated bone tissue as it is achieved with conventional non resorbable ePTFE membranes. 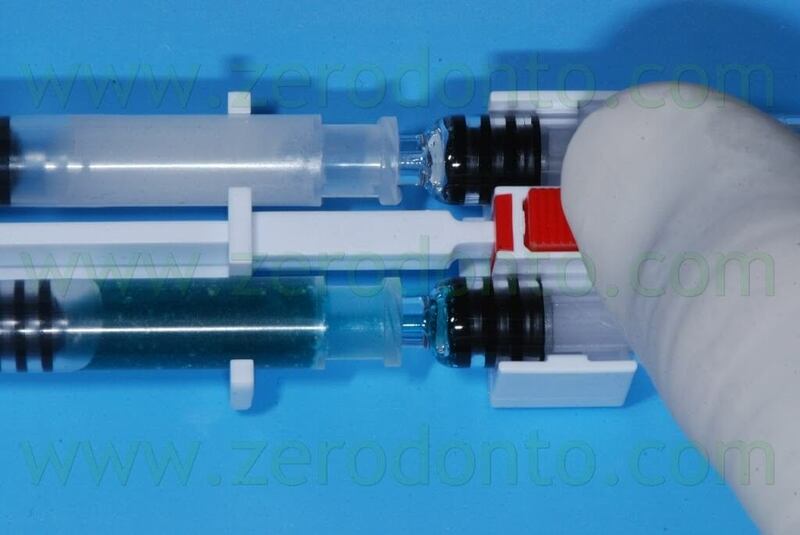 The Straumann® Membragel™ is made up of polyethylene glycol (PEG). 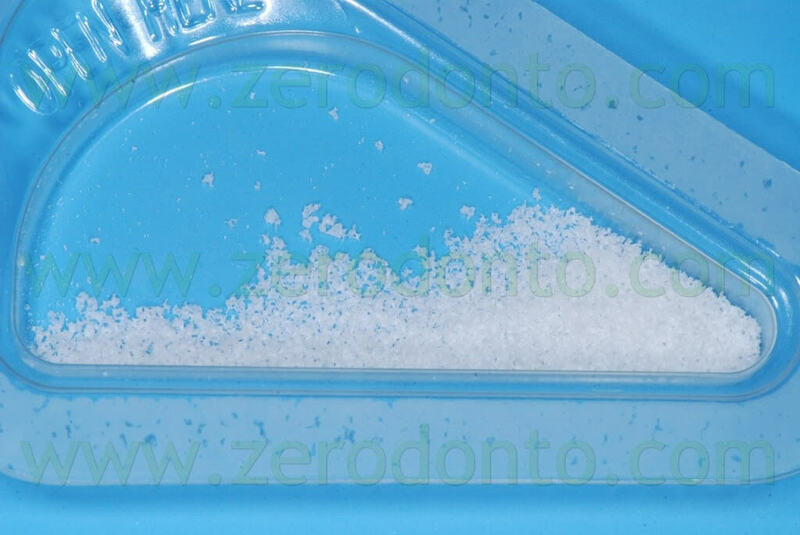 Its gelification is activated by the combination of PEG A (containing acrylate as terminal functional group), PEG B (containing thiol as terminal functional group) and activators A (viscosity modifier) and B (isotonic chemical solution creating an optimal pH to start the chemical reaction). 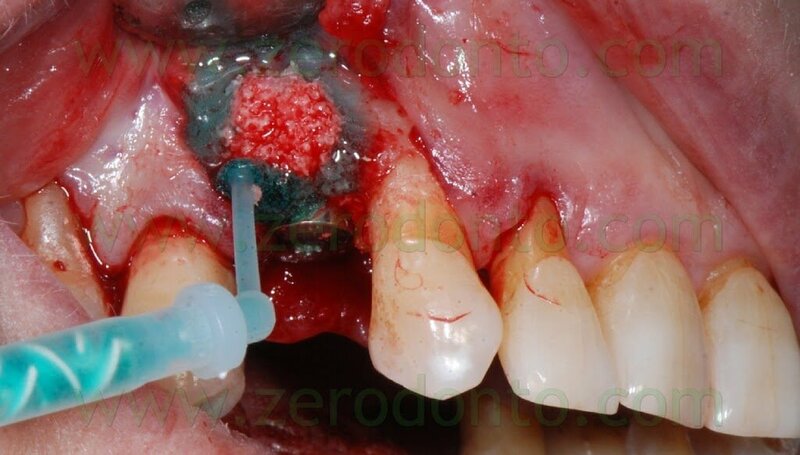 The biodegradation of the membrane is due to hydrolysis and does not create any acidification of the surrounding tissues. 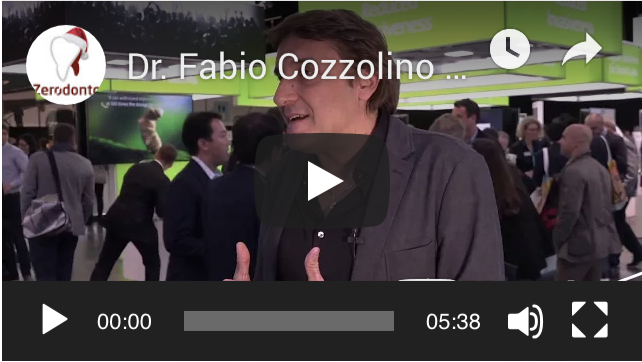 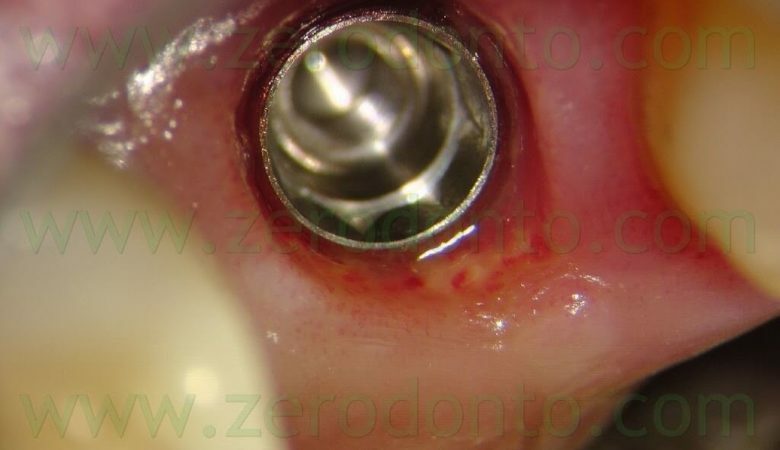 In Italy, the clinical experimentation of such an innovative membrane was performed by the research team of Prof. Luca Cordaro, Dean of the Eastman Institute of Rome (Italy). 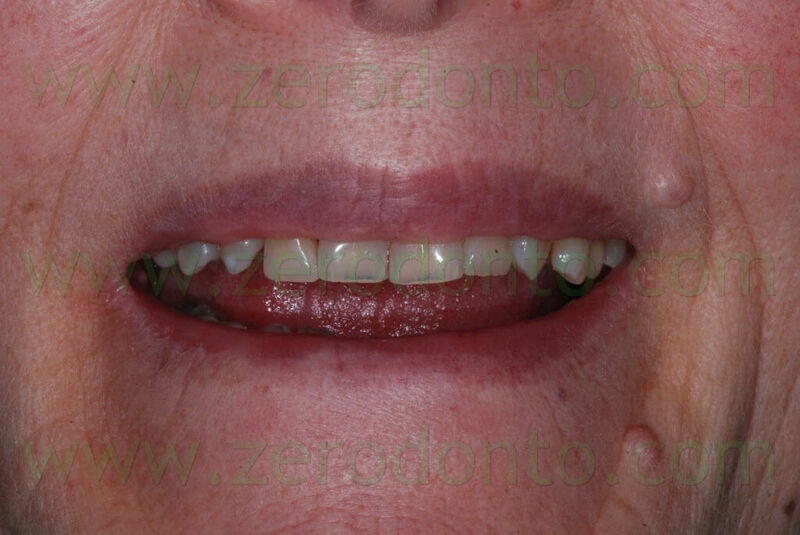 A 55 years-old female patient presented with a vertical root fracture of the tooth 14. 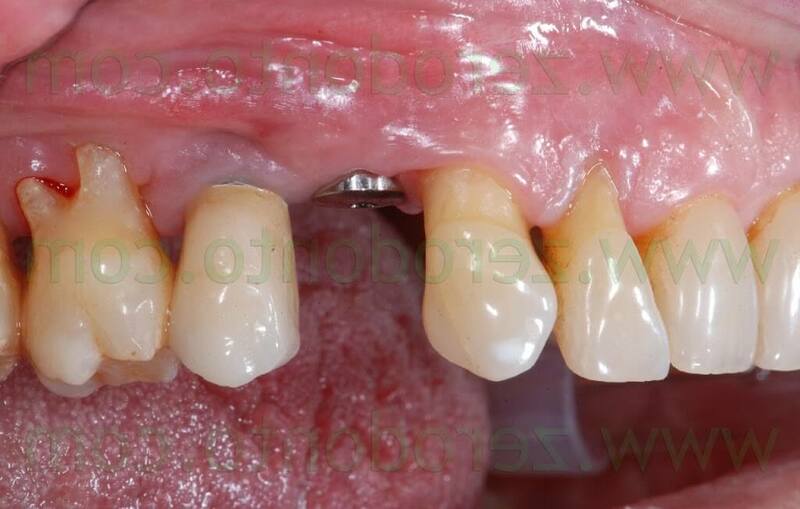 The fractured palatal fragment was immediately removed. 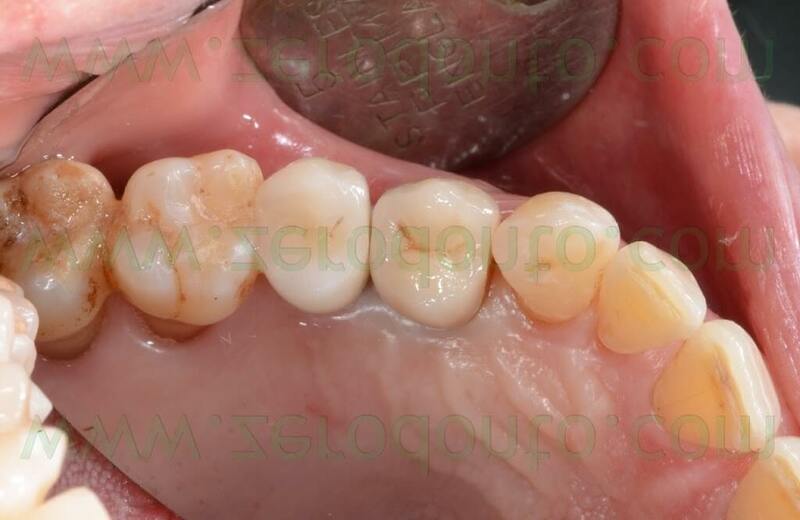 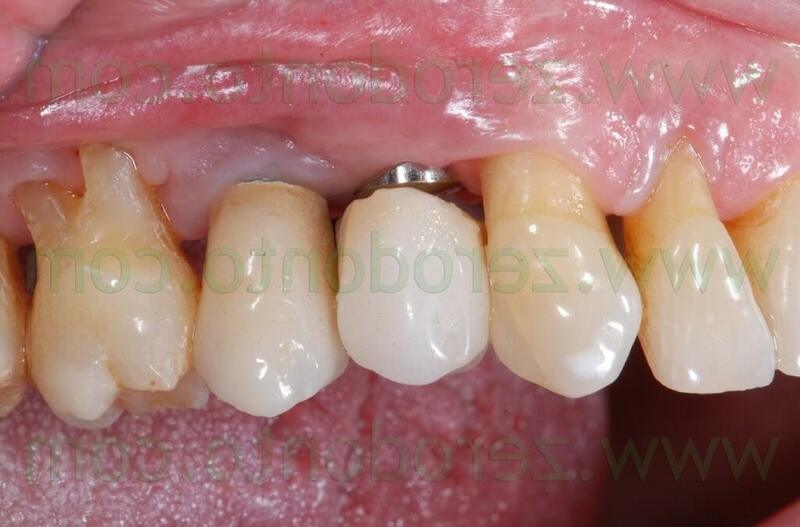 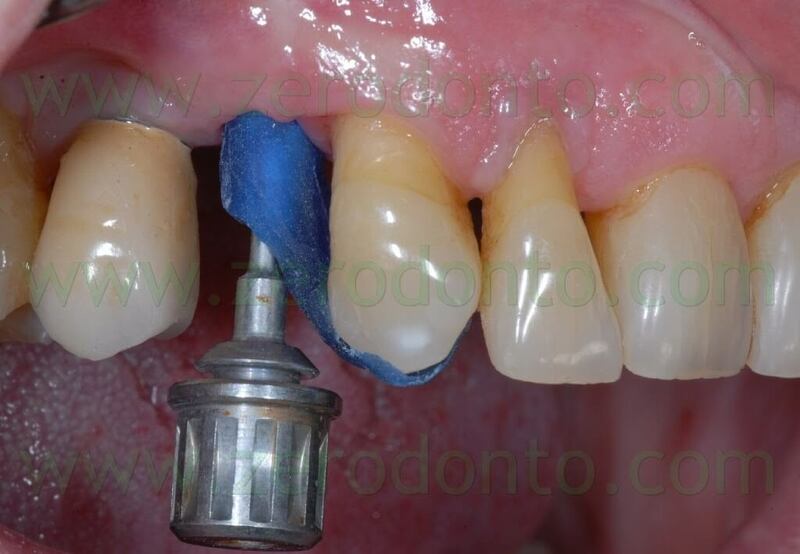 Moreover, the patient presented an implant in position 15 previously restored with a metal-ceramic crown. 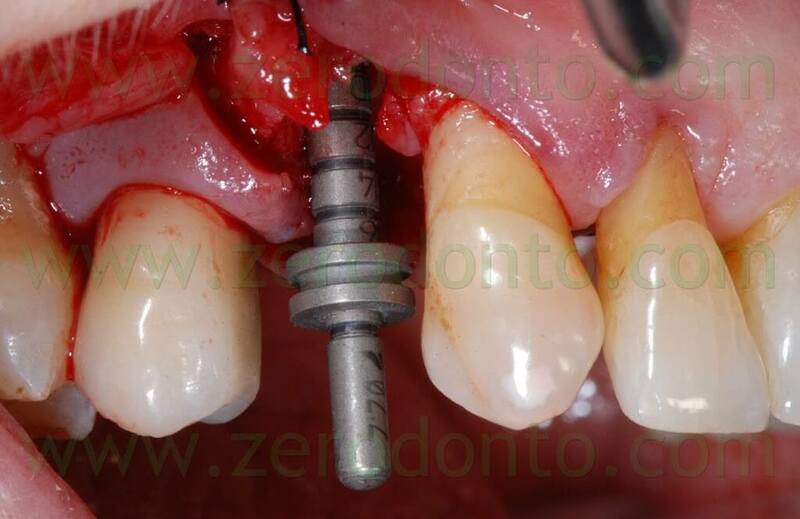 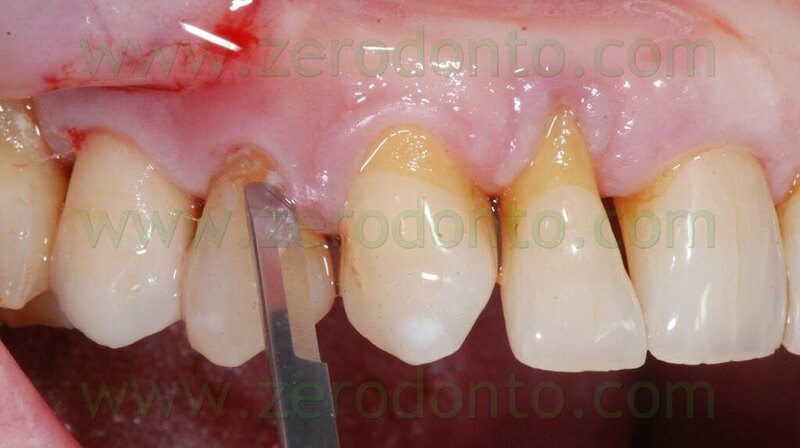 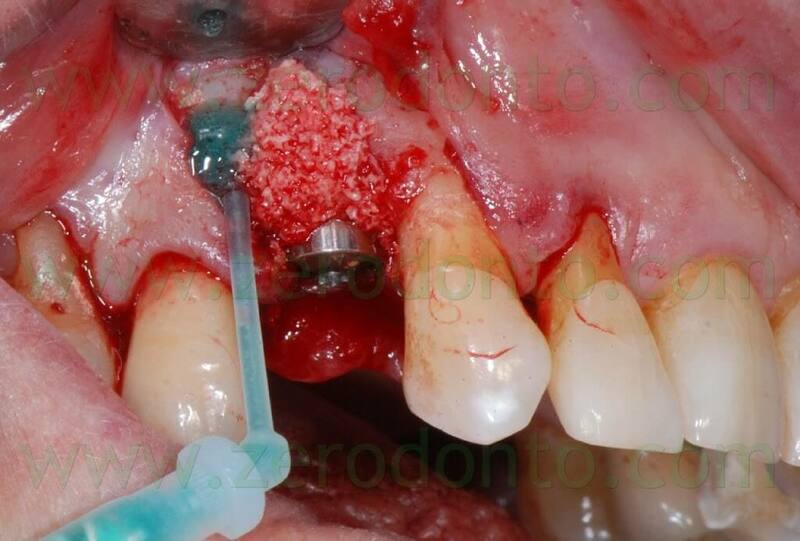 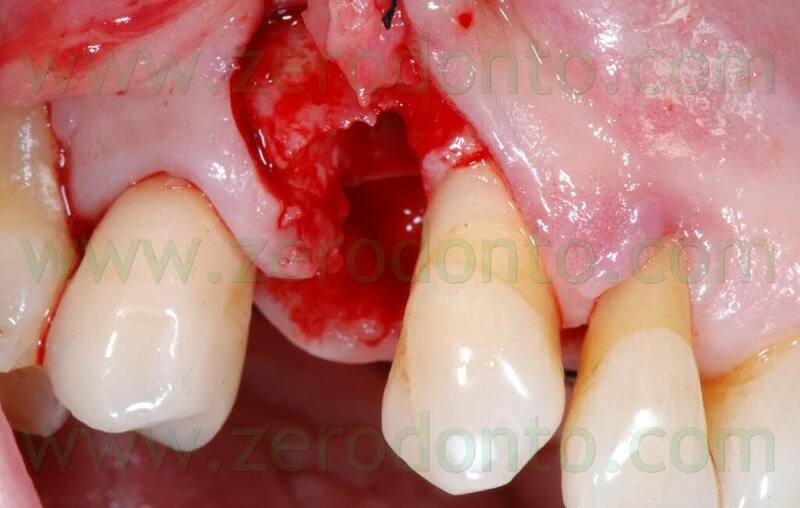 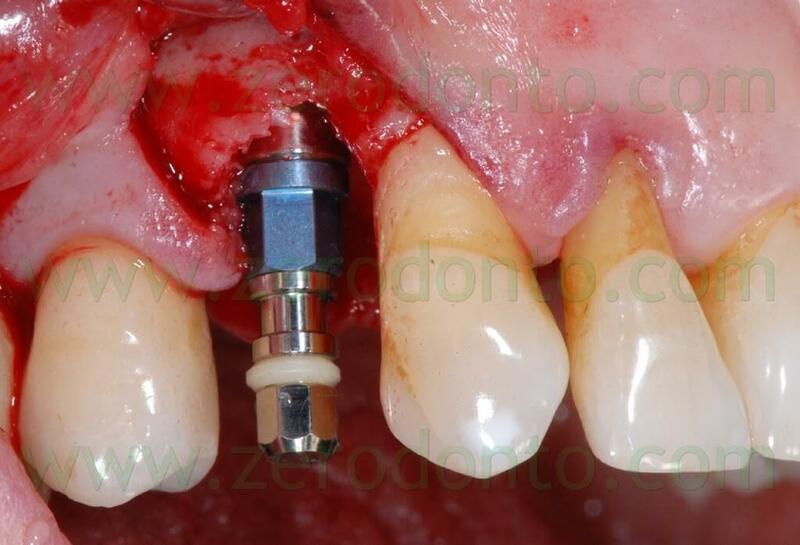 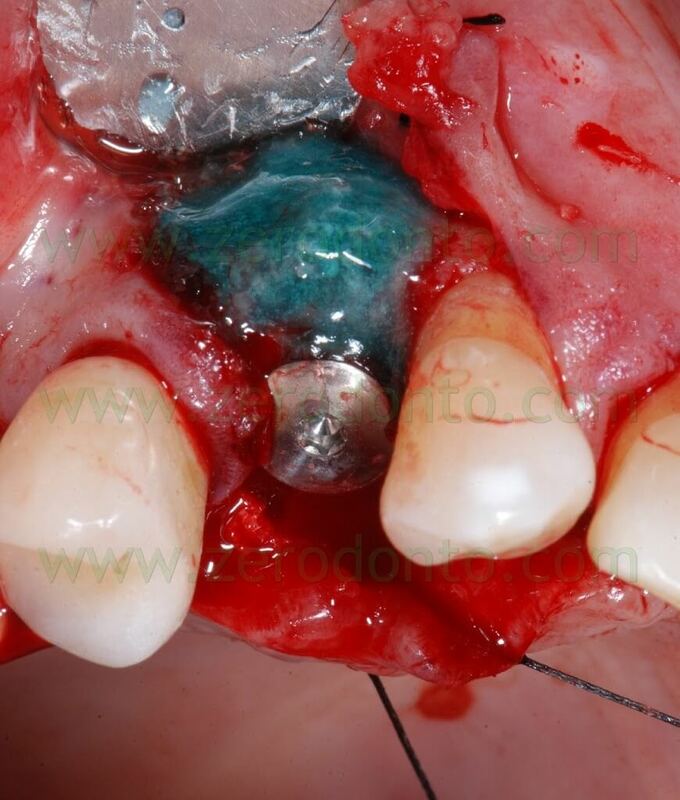 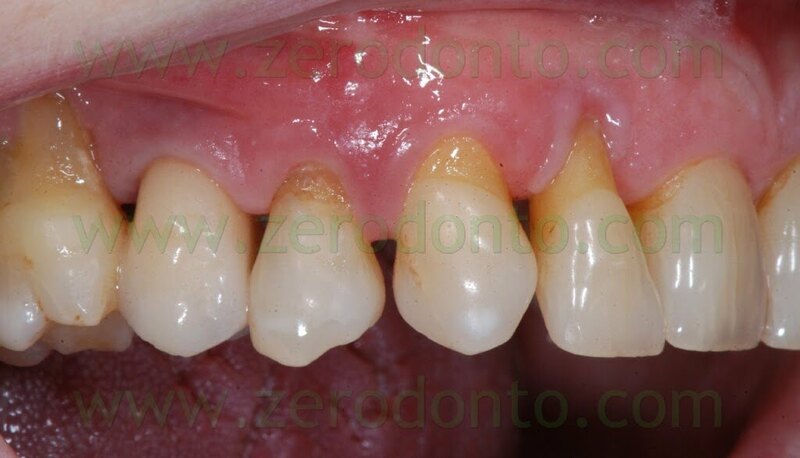 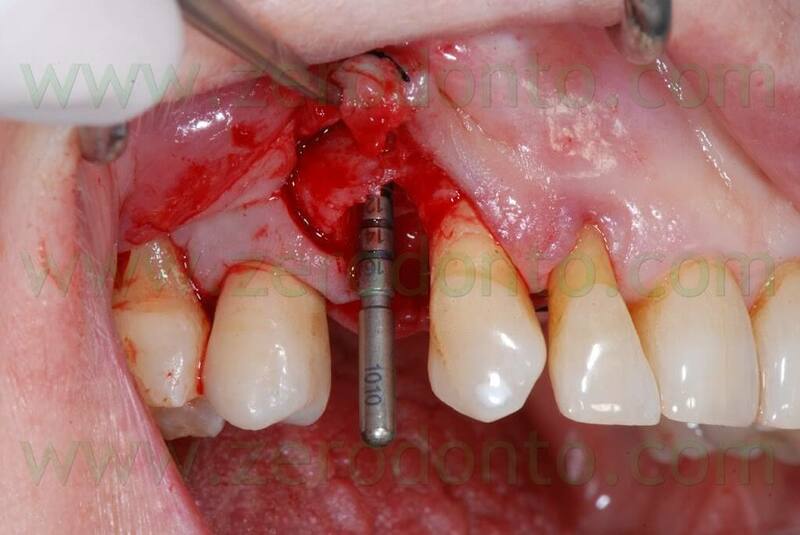 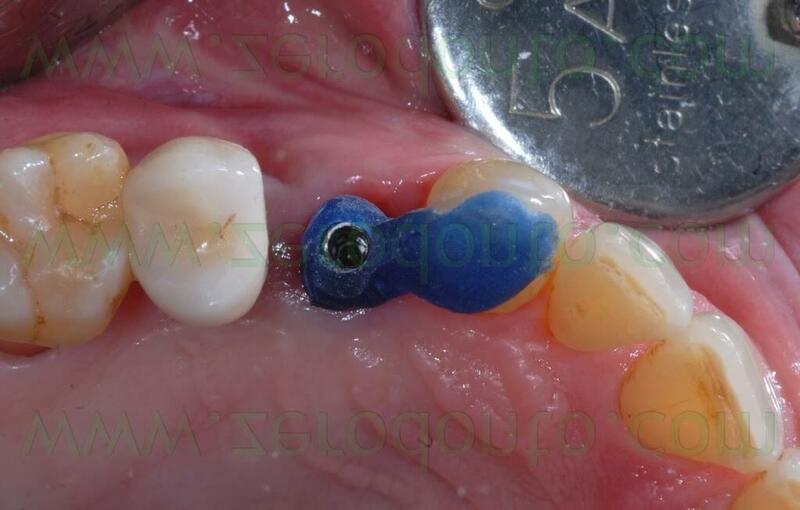 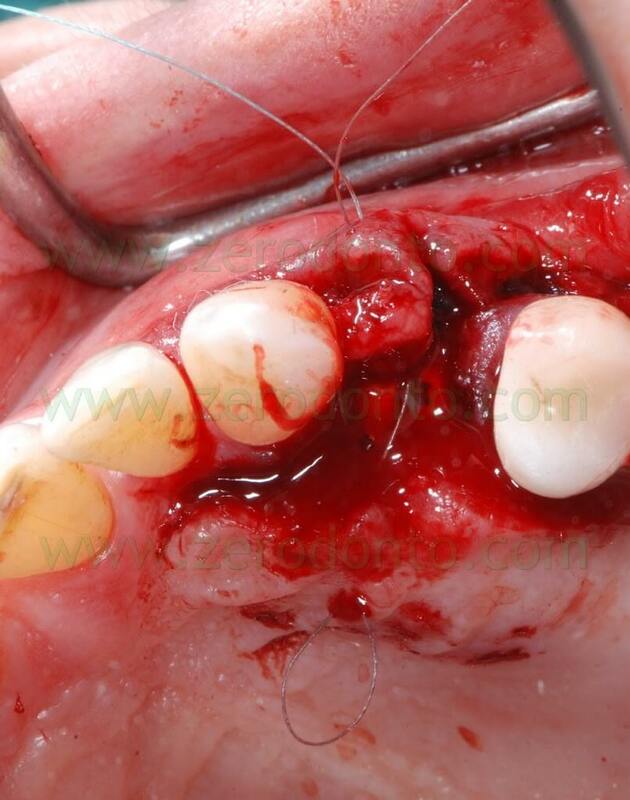 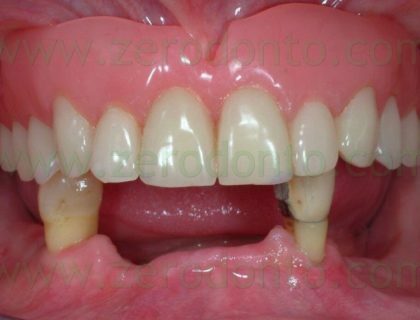 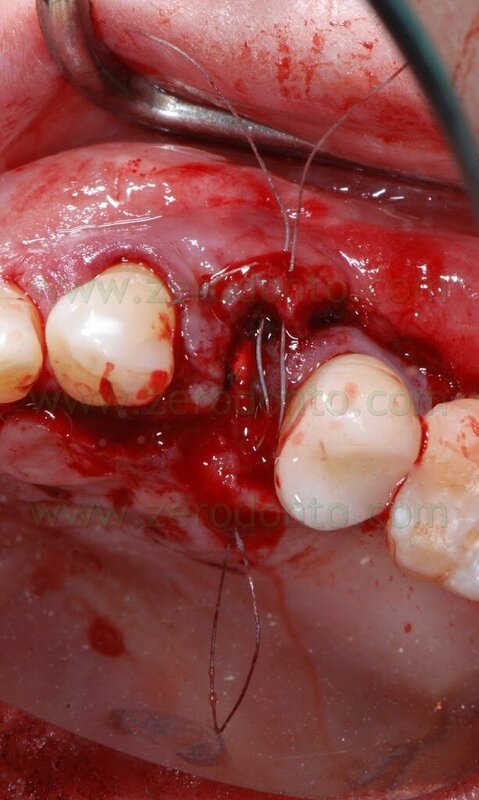 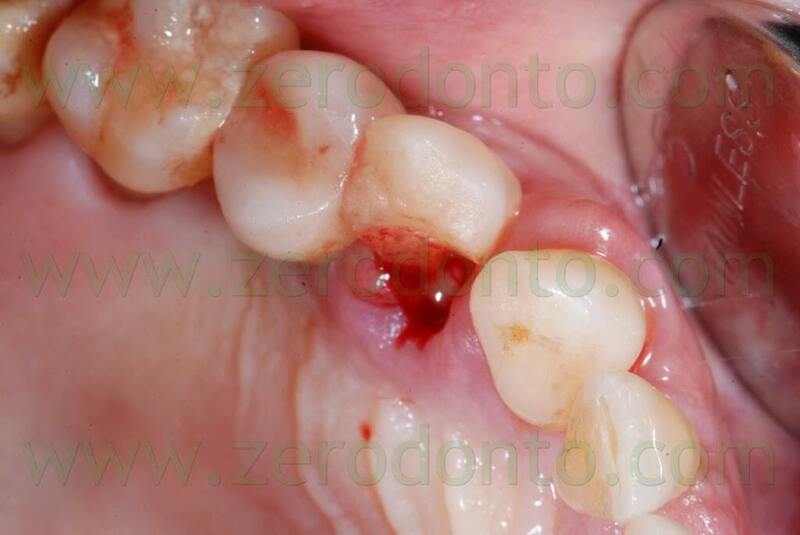 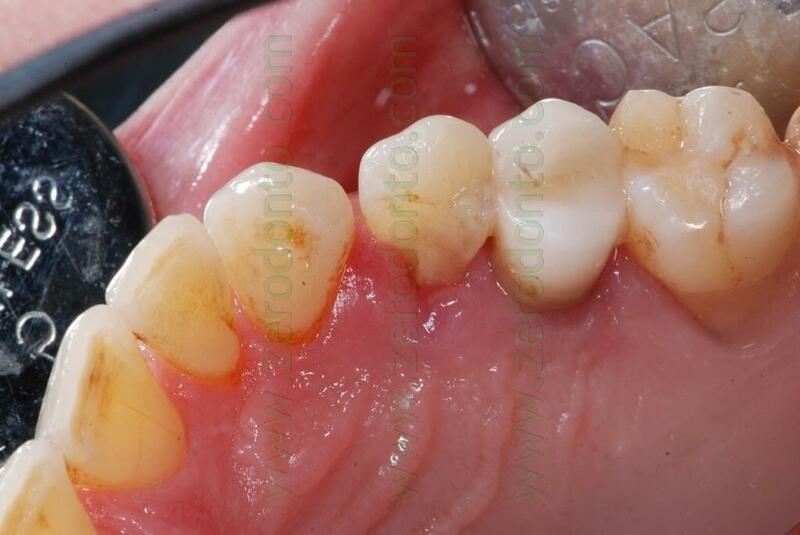 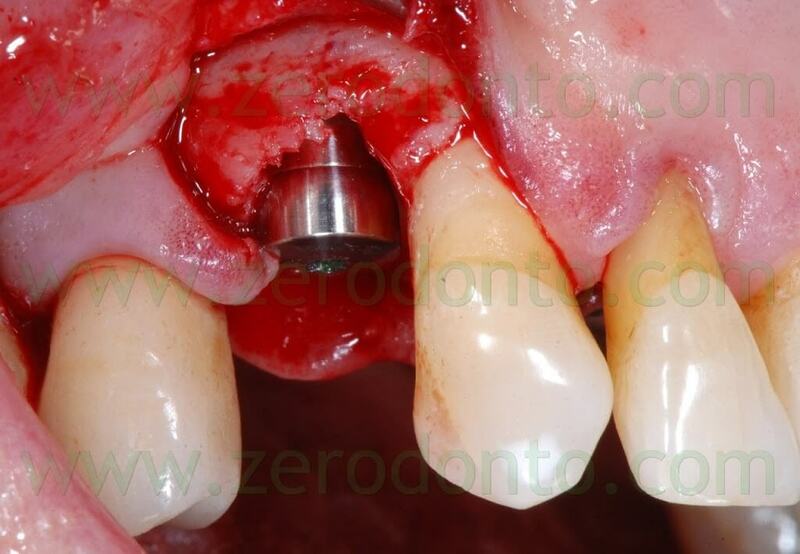 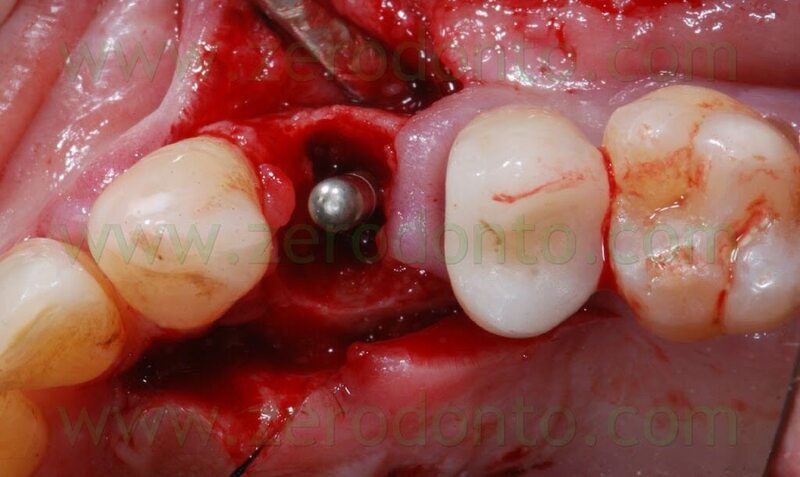 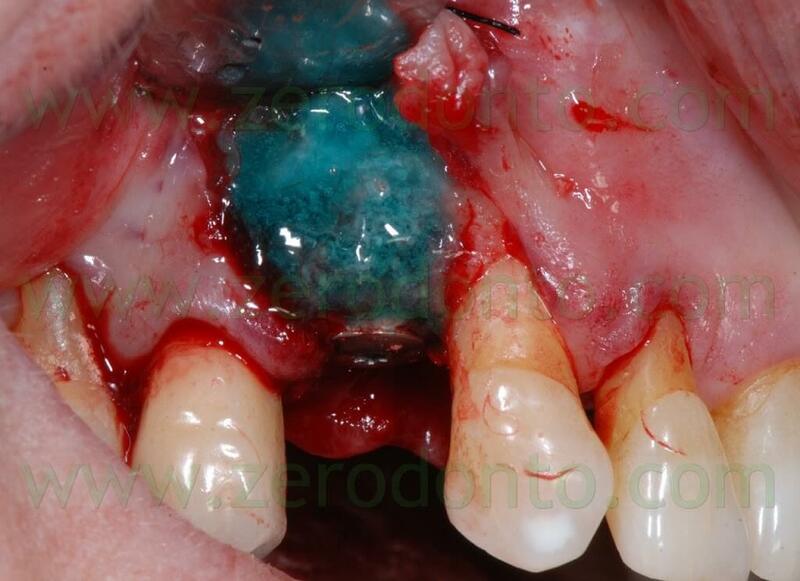 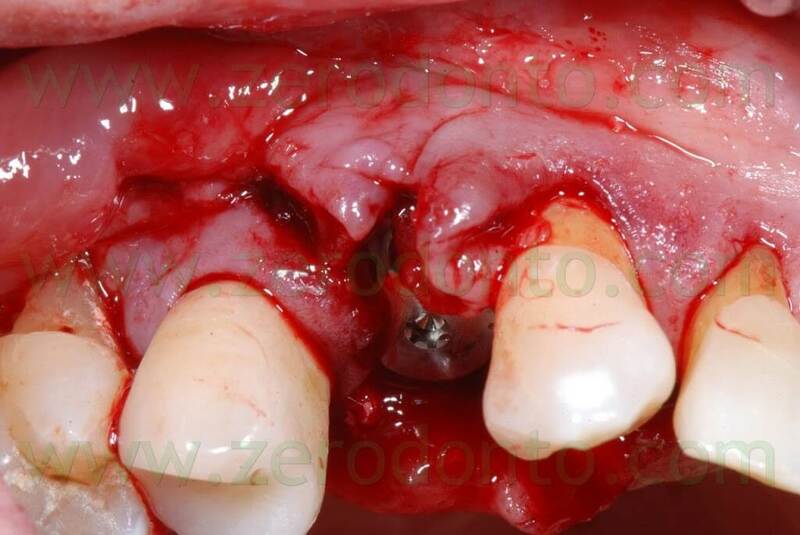 The patient asked for a fast treatment, avoiding any esthetic complication at level of such implant. 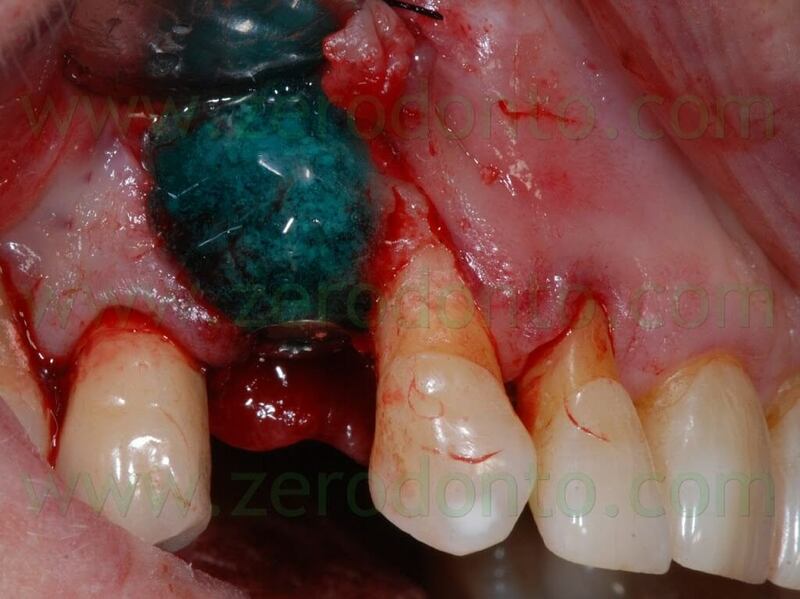 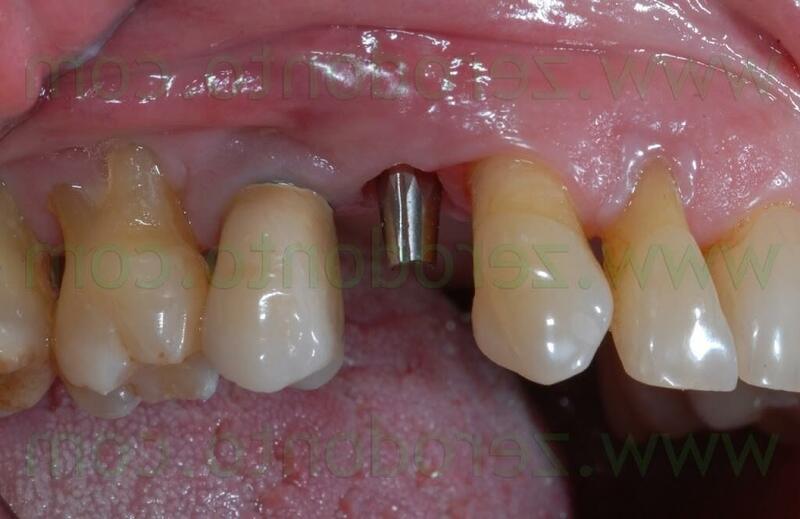 Consequently, an immediate post-extractive implant in position 14 with buccal GBR and delayed load was planned, in order to preserve as much as possible the thin layer of buccal bundle bone. 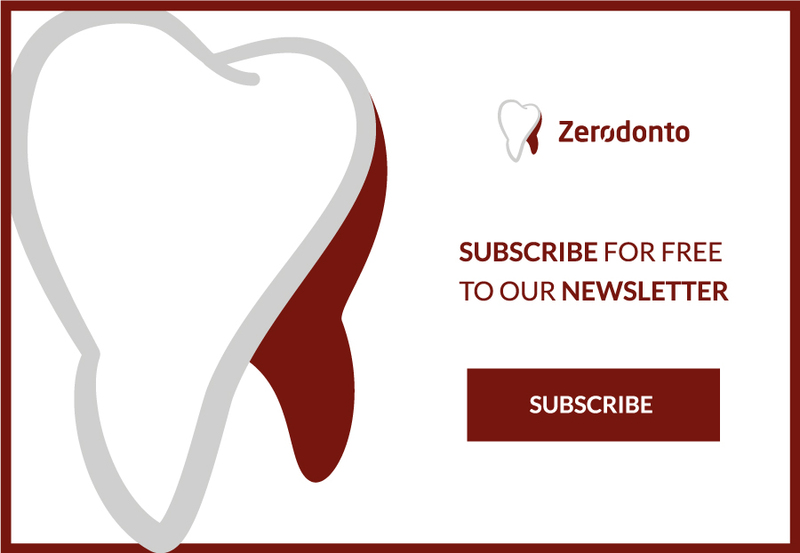 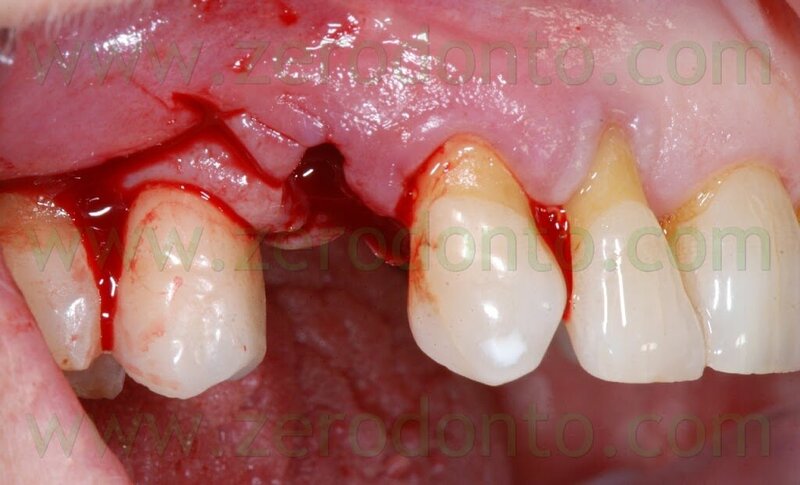 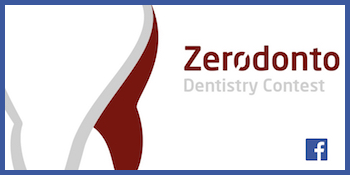 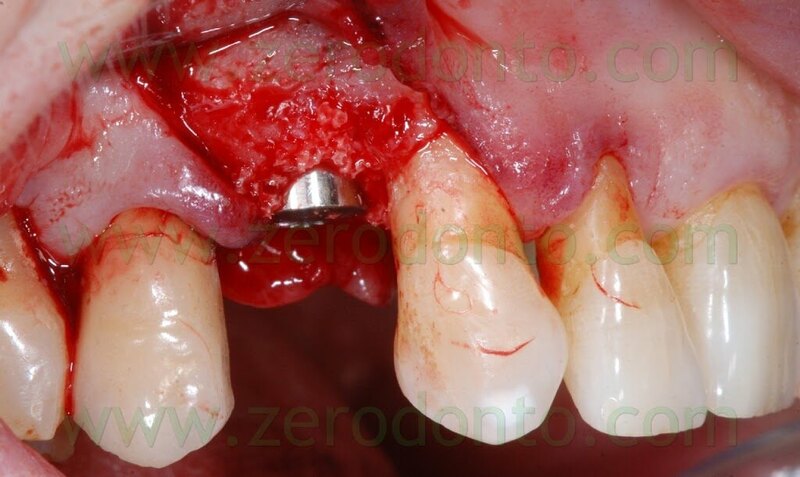 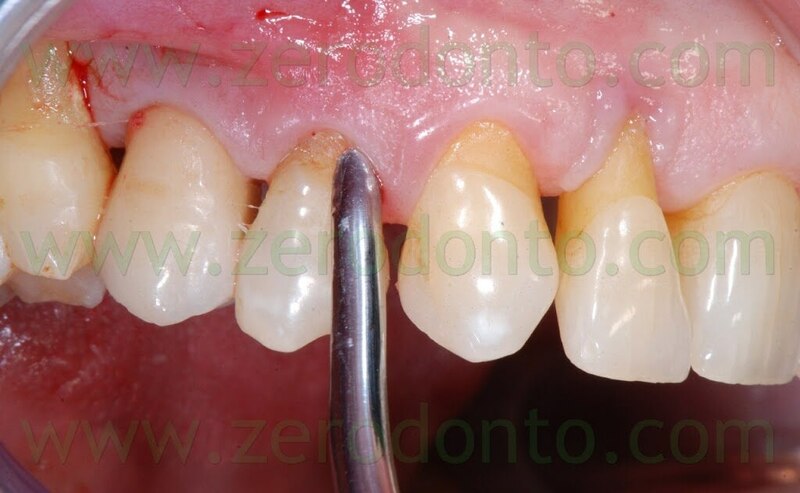 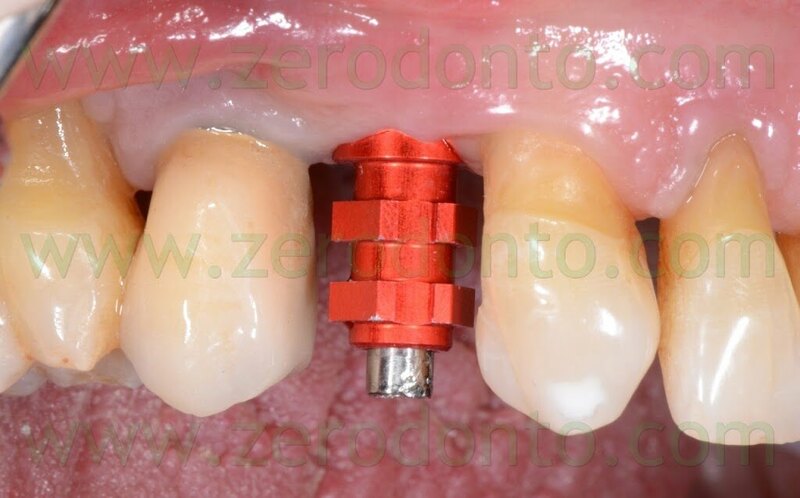 Such an approach would limit any possible soft tissue recession at level of the implant in position 15: in fact, such an occurrence would have exposed the implant neck, since the periimplant margin was at level of the junction between the crown and the implant. 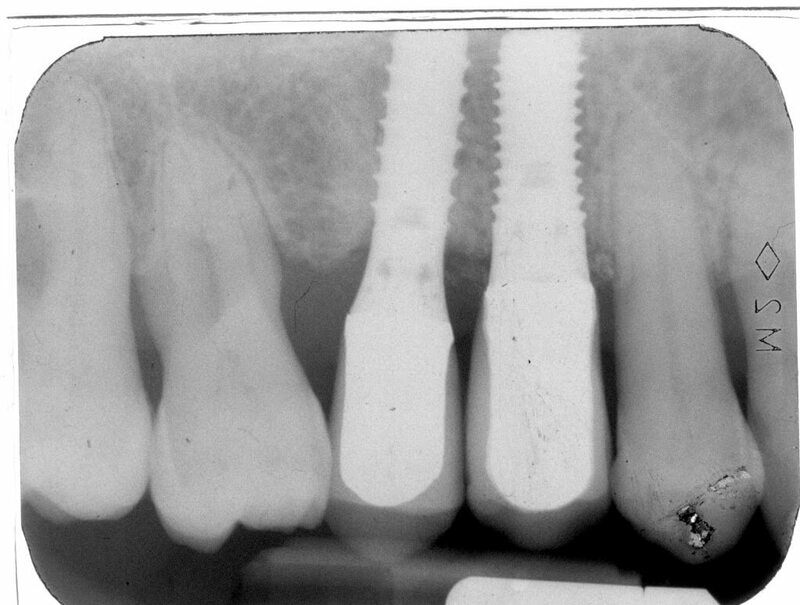 After taking an impression to produce a Maryland temporary restoration, the patient was recalled after 1 week for the implant surgery. 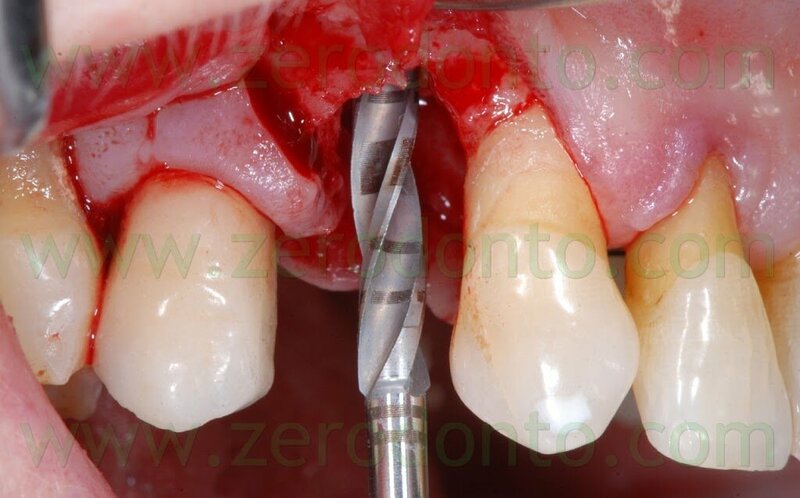 The incision was made with a Beaver blade; a distal release cut was realized, in order to preserve the distal papilla and limit any possible recession at level of the 15. 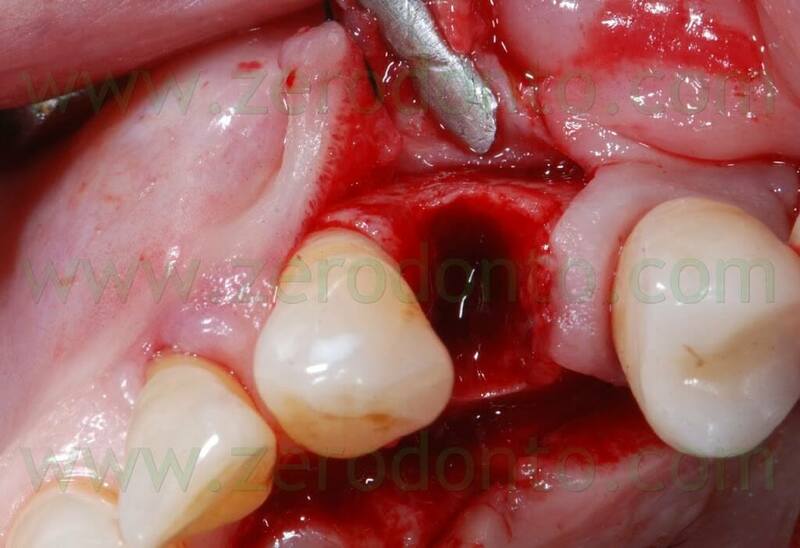 In the same time, the fractured tooth in position 14 was atraumatically extracted. 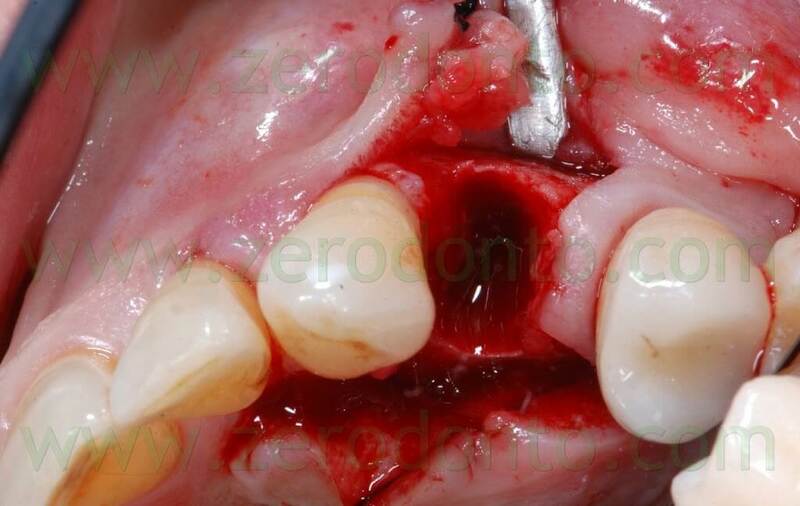 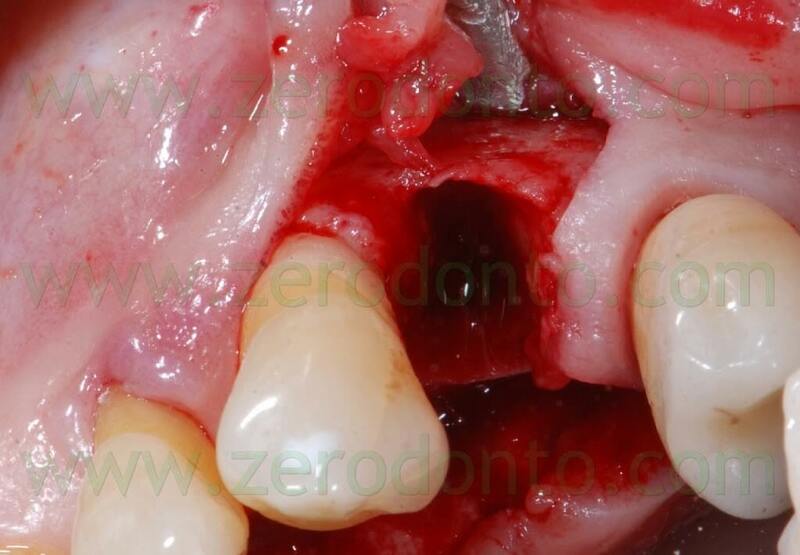 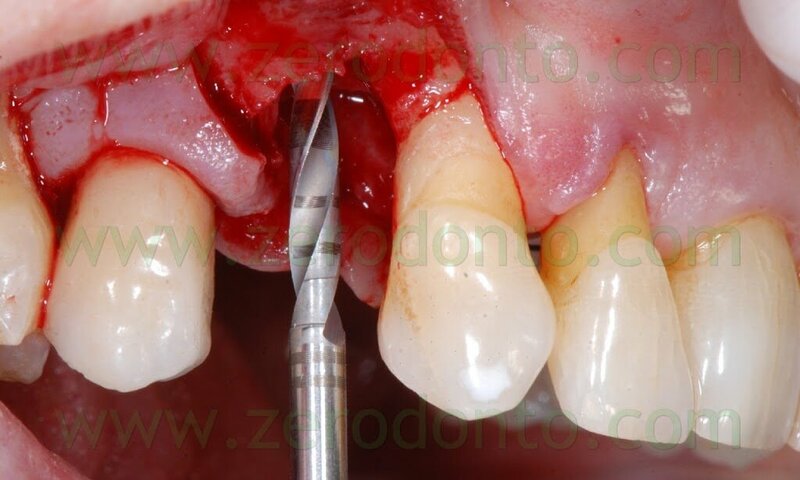 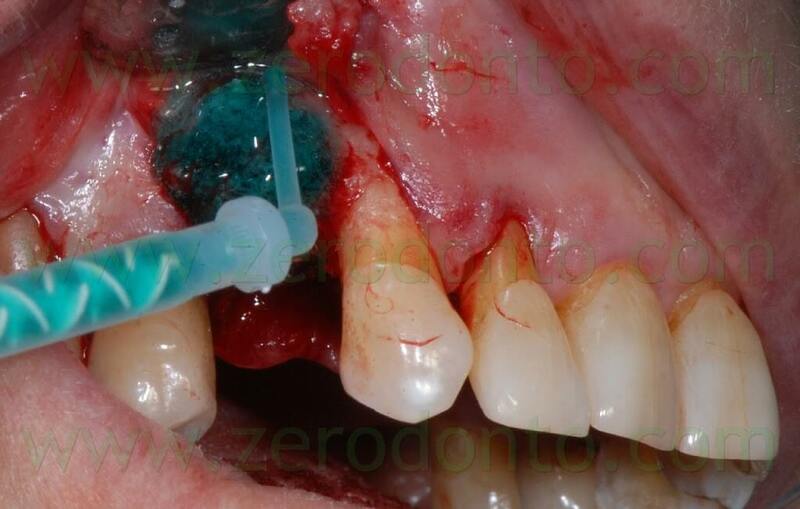 After elevating the flap, a thin layer of buccal bundle bone was noticed. 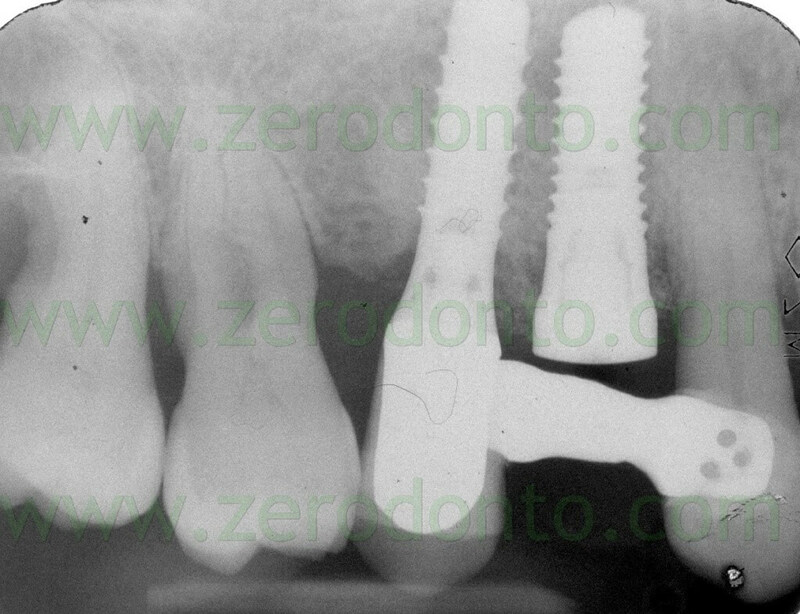 If no regenerative approach had been adopted, such bundle bone would have been resorbed with an undesired lengthening of the crown in position 14. 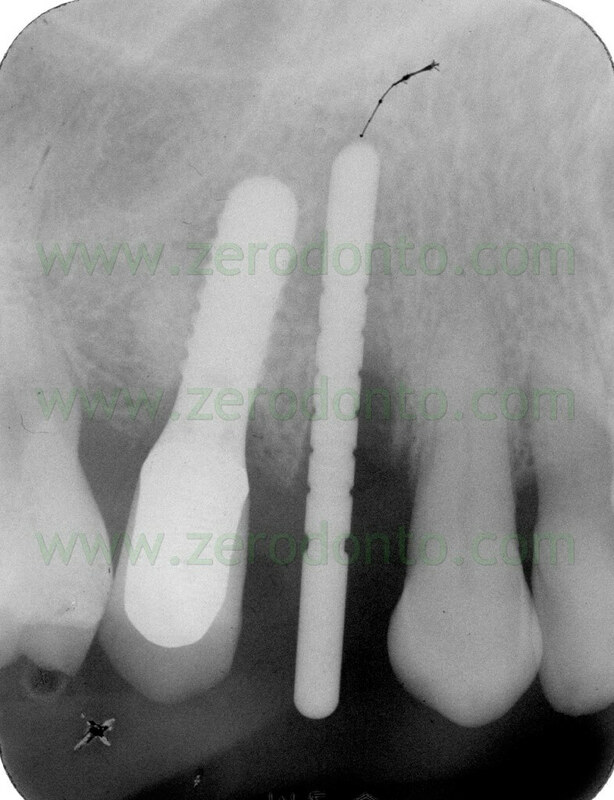 The following implant drills were used: multi-blade ball-shaped burs, 2.2 mm, 2.8 mm, 3.5 mm and the post-extractive implant drill (the latter was used to shape the implant site with the proper tapering). 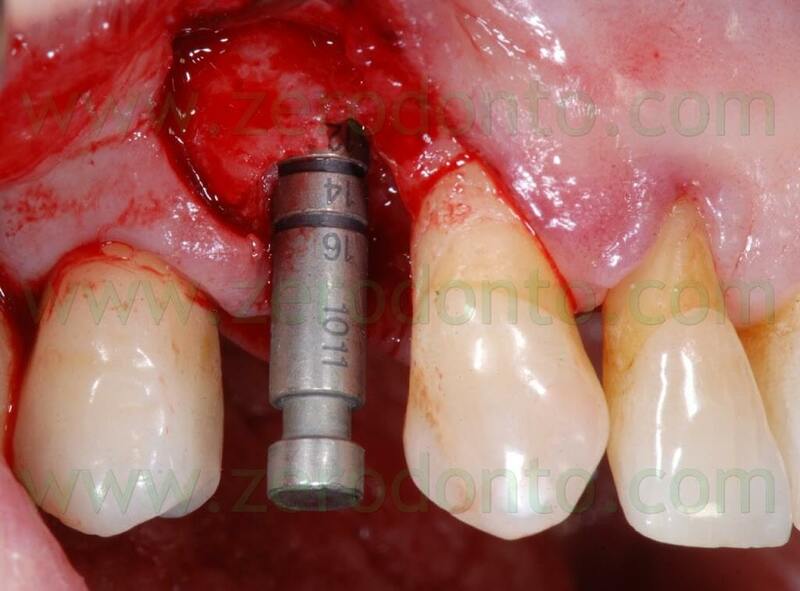 The depth measurers were used to verify the implant site position: the implant was inserted as much parallel as possible to the adjacent tooth and implant and slightly more palatally, in order to limit the buccal bone resorption. 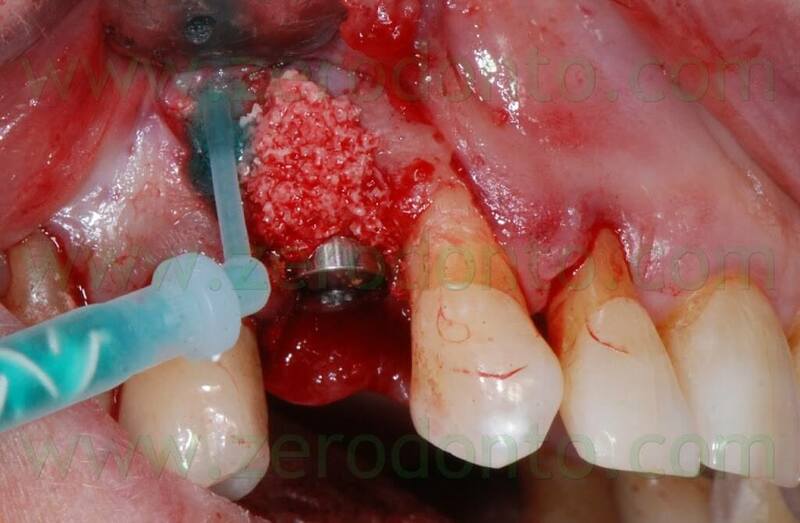 A proper amount of autologous bone was recovered from the threads of the implant drills; moreover, some more bone was taken from the palatal surface of the implant site using a Micross® bone scraper (Meta). 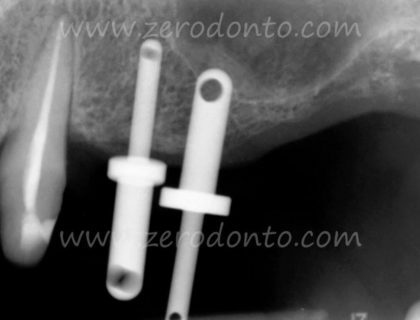 The autologous bone was mixed with the Straumann® BoneCeramic substitute in 1:1 ratio. 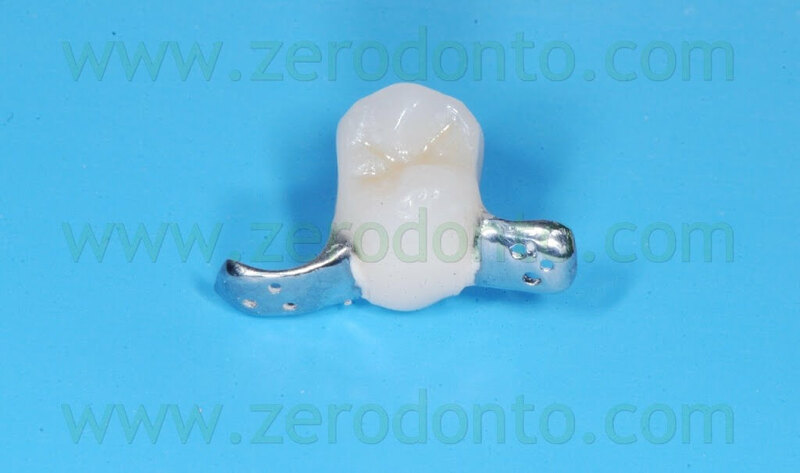 The BoneCeramic is a synthesis product made up of homogeneous biphase calcium phosphate, containing 40% of tri-calcium phosphate (TCP) and 60% of hydroxyapatite. 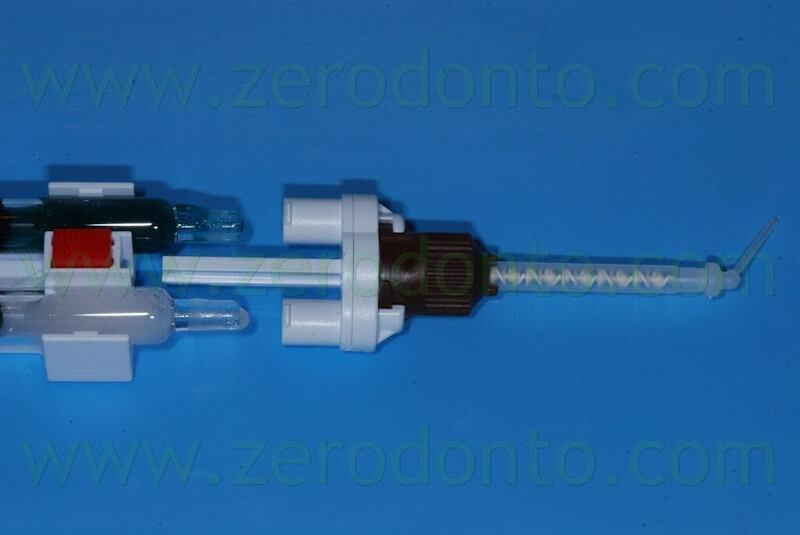 Such a bone substitute is mixed with the autologous bone because of its osseoconductive properties as well as its property to preserve the volume of the bone defect, avoiding the resorption of the autologous bone. 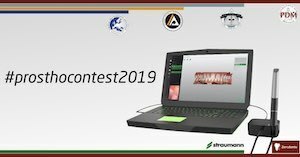 It is paramount to remove the Straumann® Membragel™ from the refrigerator at least 30 minutes before the surgery, in order to reach the room temperature gradually. 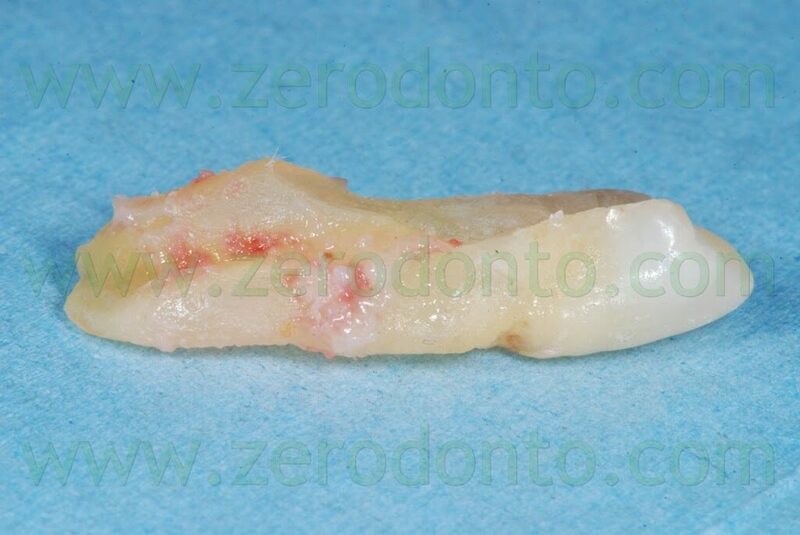 The membrane can be maintained at this temperature no longer than 72 hours. 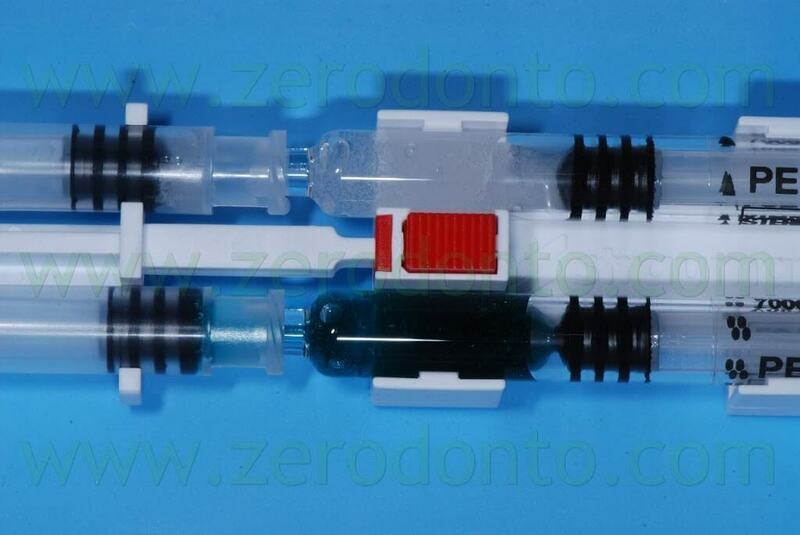 After unscrewing and removing the protecting tips of the syringes on a hard sustaining surface and coupling the connection symbols (triangles/circles), the 4 syringes have to be assembled in order to achieve a stable connection and a “click” has to be heard. 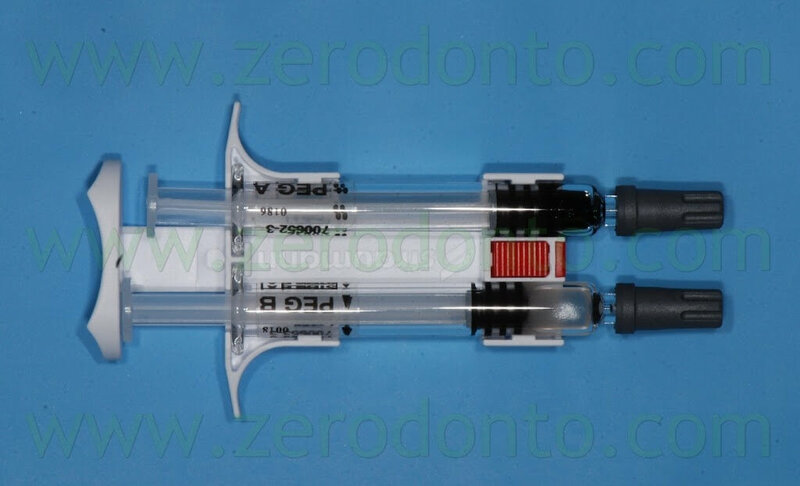 The material has to be mixed 15 times, moving it from one side to another in the syringes, until the PEG syringes are completely filled. 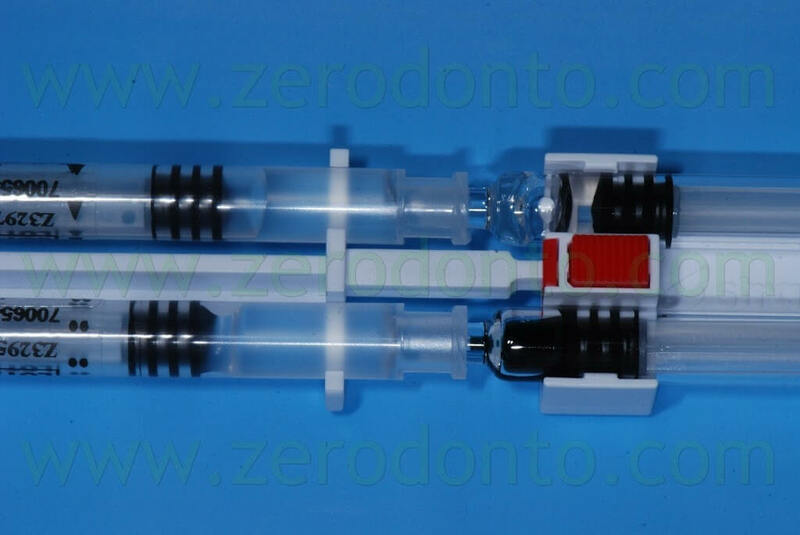 Then, the syringes have to be unlocked pushing the red button and the applicator has to be connected by means of the T-lock. 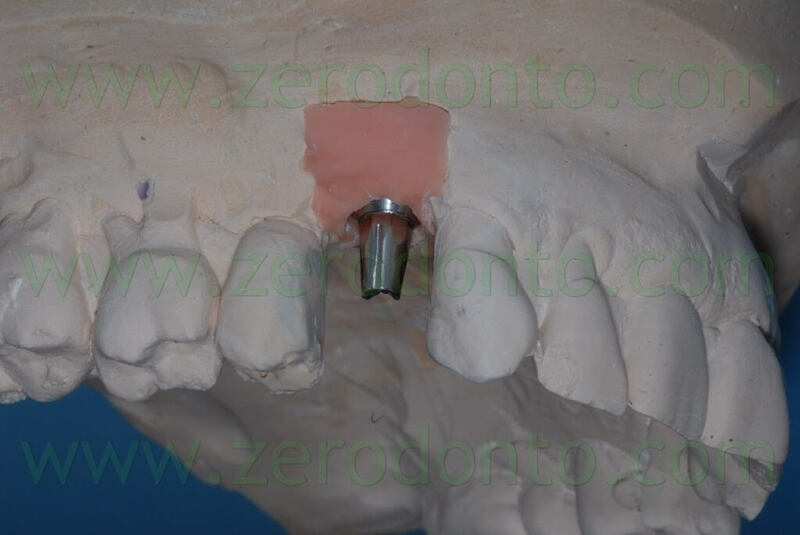 Finally, the material can be used within 45 minutes. 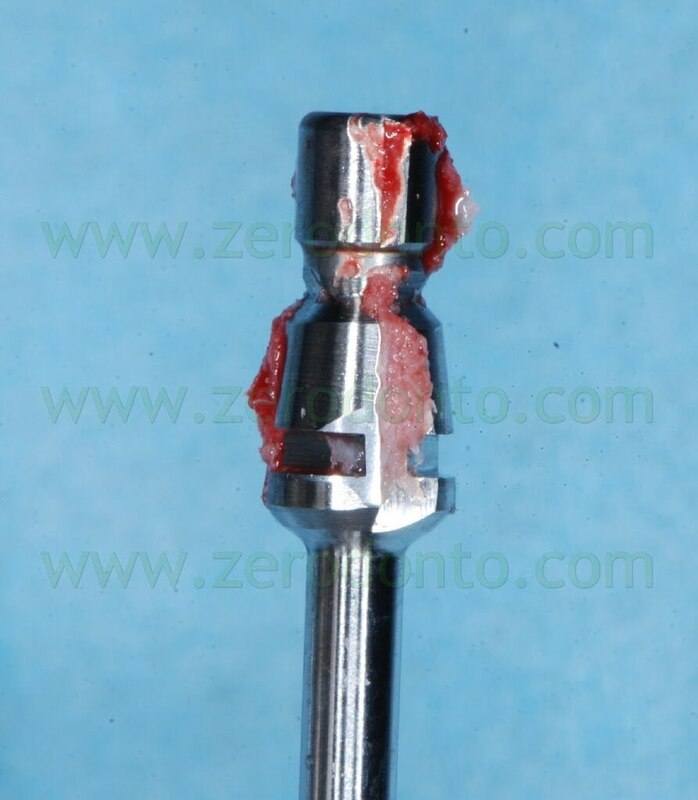 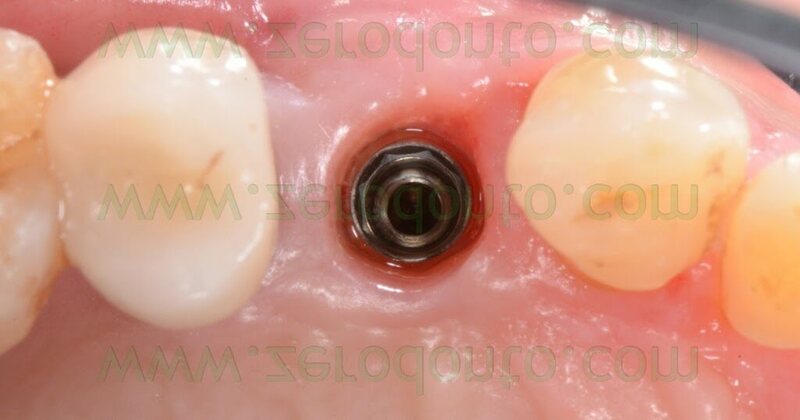 A SLActive TE Straumann implant (diameter: 4.1-4.8 mm; length: 10 mm) was placed with primary stability of 40 N. A non submerged cover screw was used. 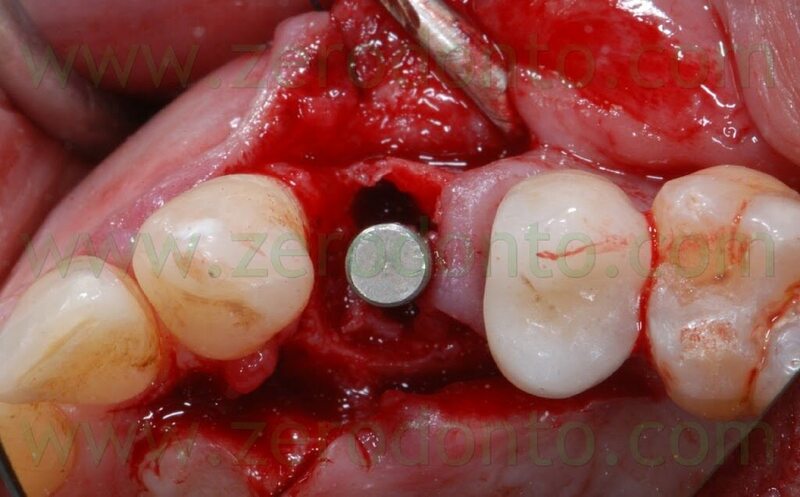 Once the implant was inserted, a bone graft was placed either in the buccal gap between the bone and the implant (approximately 2 mm) and buccally to the thin layer of cortical bone, in order to make a buccal bone regeneration to compensate for the resorption of the bundle bone. 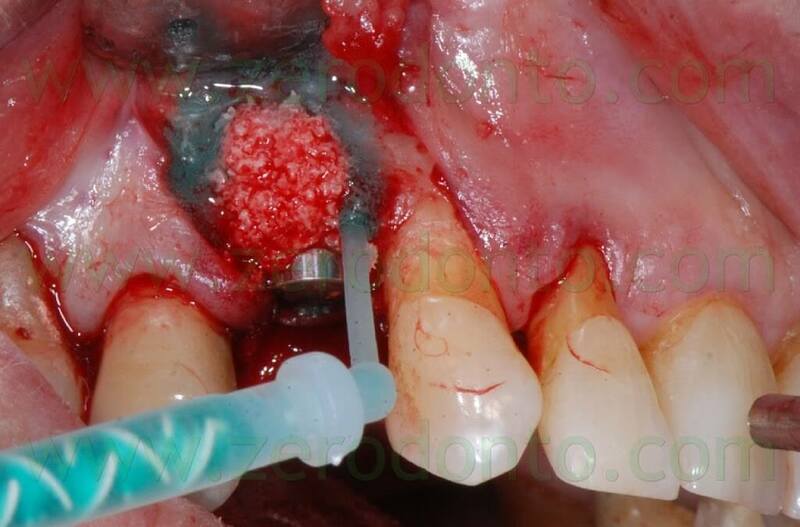 After placing the bone graft, the blood excess was removed using a micro-aspirator, so as to guarantee an otpimal adhesion of the Membragel. 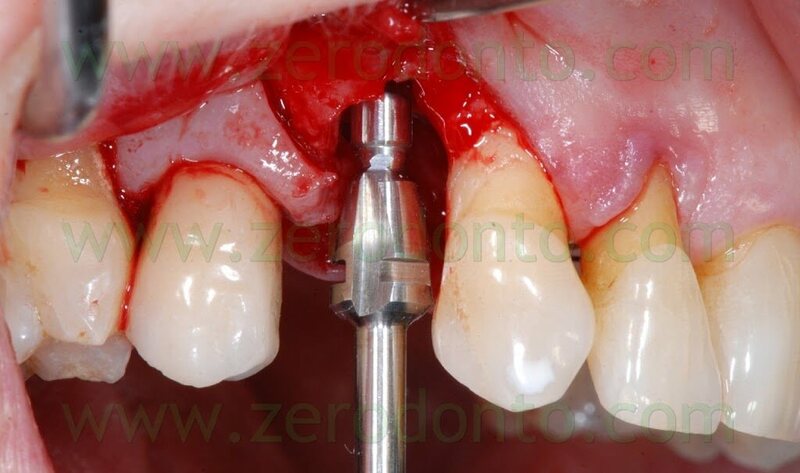 It was demonstrated that an overbuilding of the bone graft is not necessary with this liquid membrane. 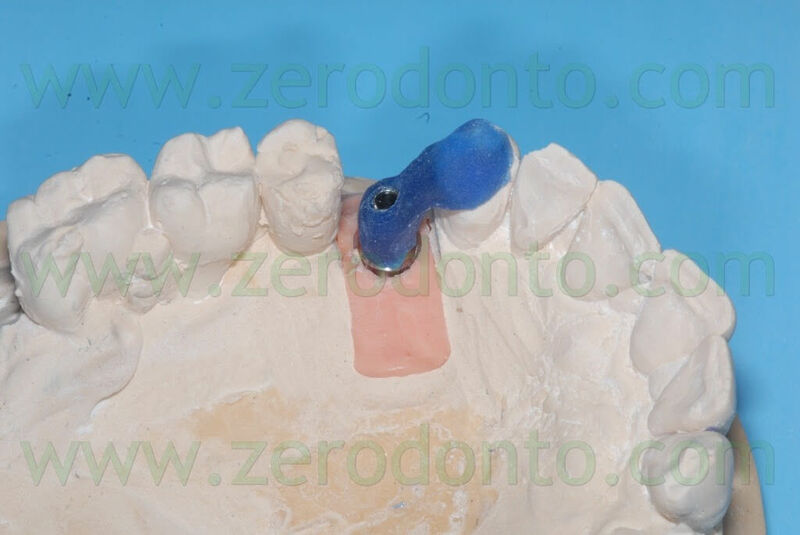 Therefore, the Membragel was spread starting from the periphery of the bone defect. 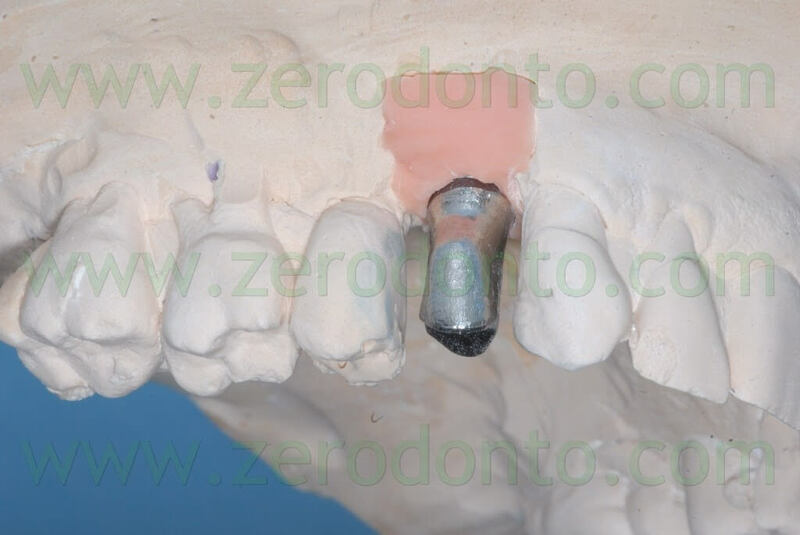 It is paramount not to interrupt the placement of the membrane for longer than 30 seconds, so as to avoid the obstruction of the applicator. 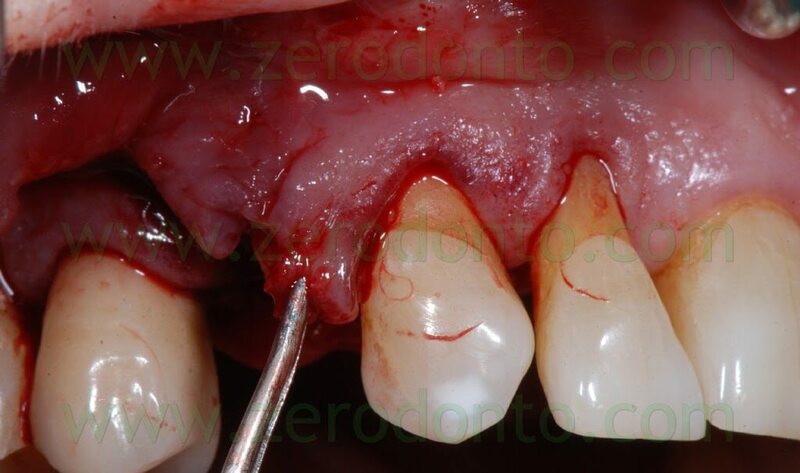 Moreover, it is recommended to place a uniform layer of gel as thin as possible, since the polymerization occurs in about 60 seconds and any modification of the membrane shape may result difficult. 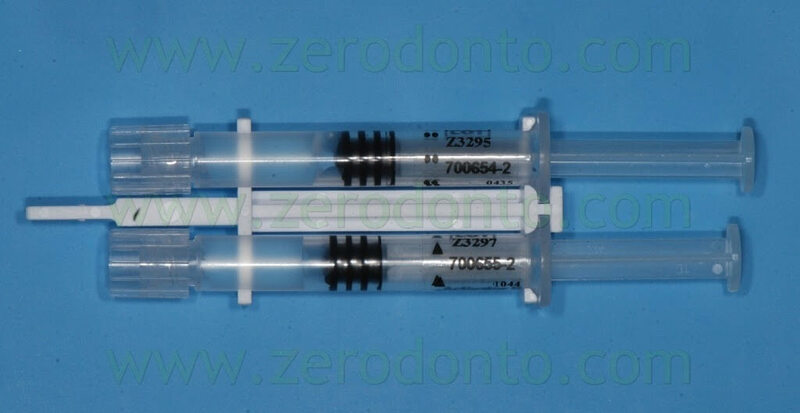 In order to optimize the adhesion, the Membragel has to be spread 1-2 mm over the margins of the bone defect. 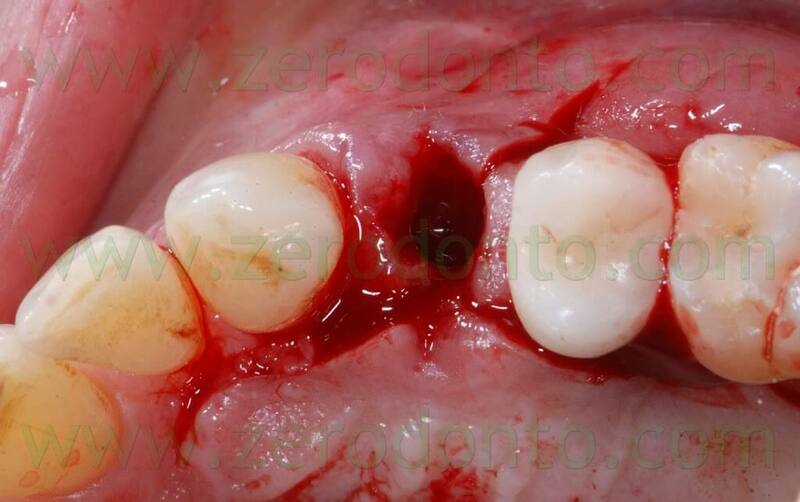 Some authors suggest to cut the outer margins of the membrane, optimizing their shape by means of a blade. 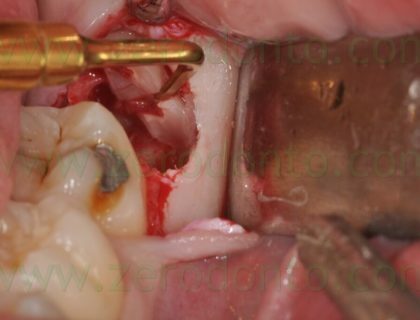 Nonetheless, in the present clinical case, such an approach caused the detachment of a fragment in the distal part of the membrane. 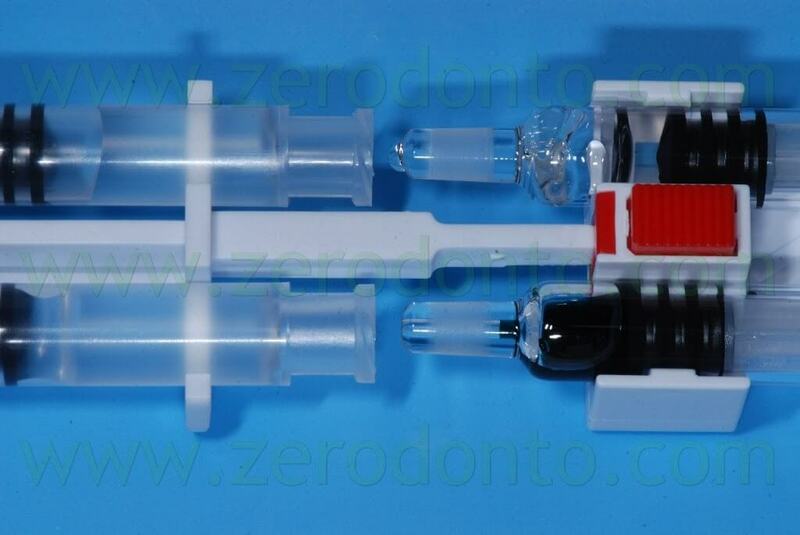 Unfortunately, the kit is not provided with a second mixing tip and the setting of the material inside the syringes occurs in about 60 seconds, making the membrane no longer usable. 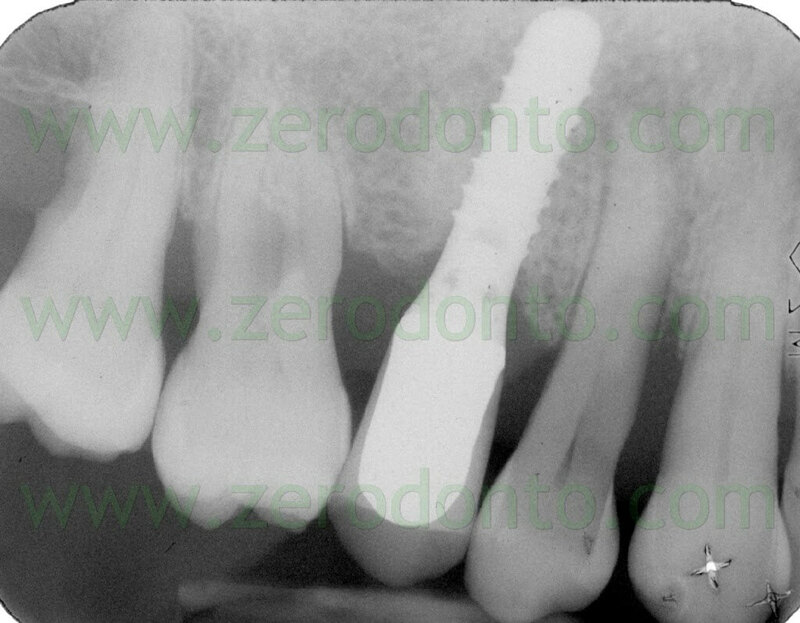 Such an occurrence was bypassed extruding a little amount of gel approximately every 40 seconds, avoiding its complete setting. 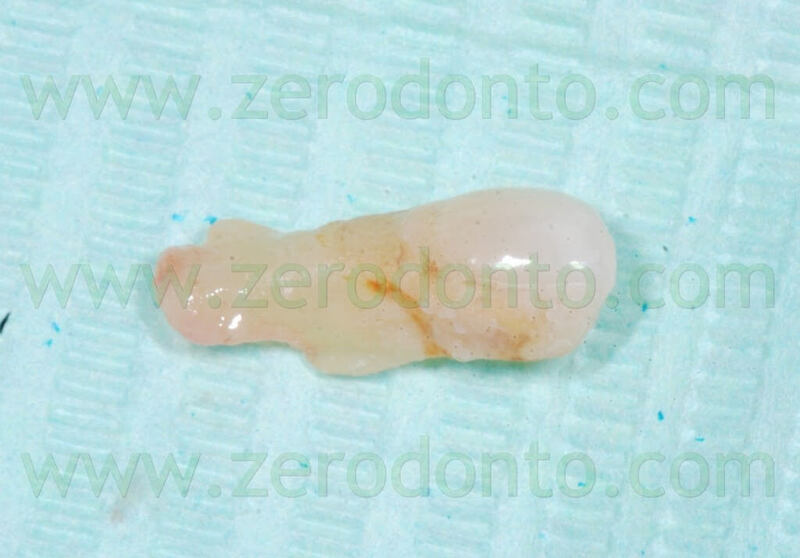 Consequently, it was possible to replace the detached fragment of the membrane and the finishing was made before the complete polymerization using a little surgical excavator. 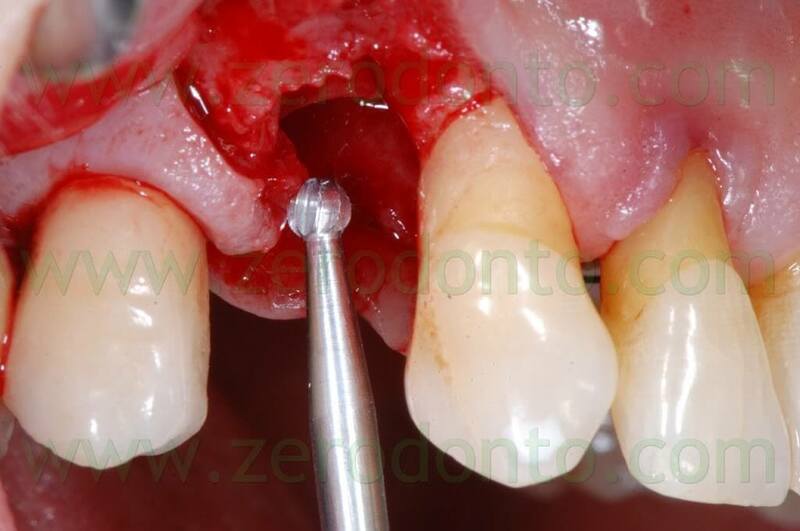 In this way, the margin of the membrane was placed at about 1 mm from the vertical distal release cut. 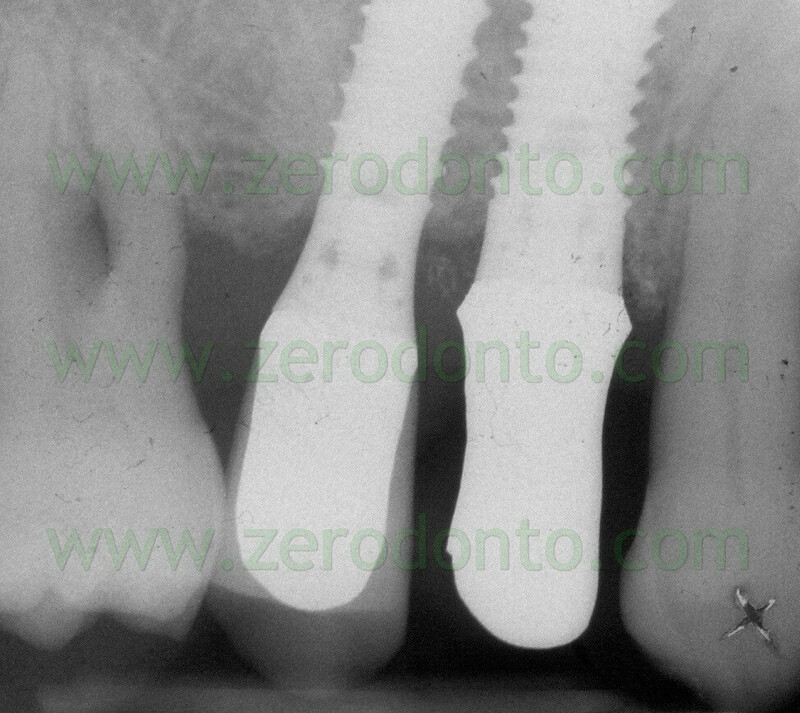 Because of the adjacent implant, the vertical release cut was close to the membrane: this is not conforming with the standard protocol that recommends its placement at 4-5 mm from the bone defect. 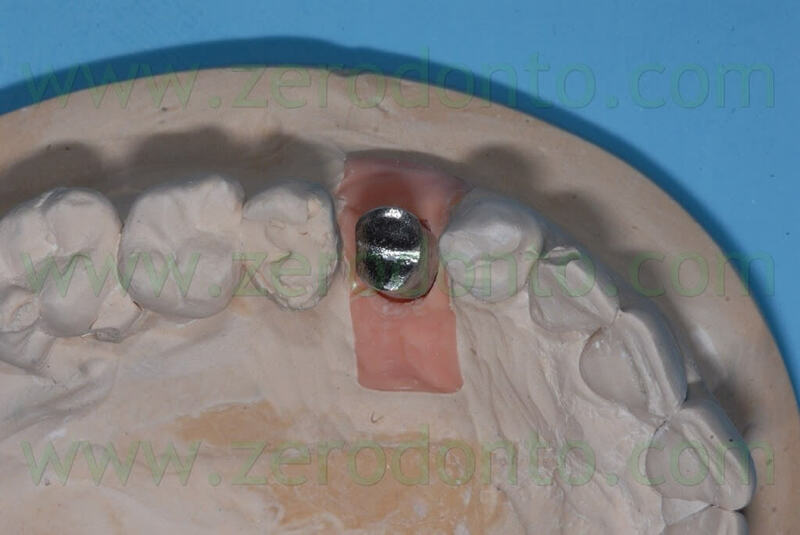 To date, moreover, the standard clinical procedures suggest to use the Membragel with submerged implants. 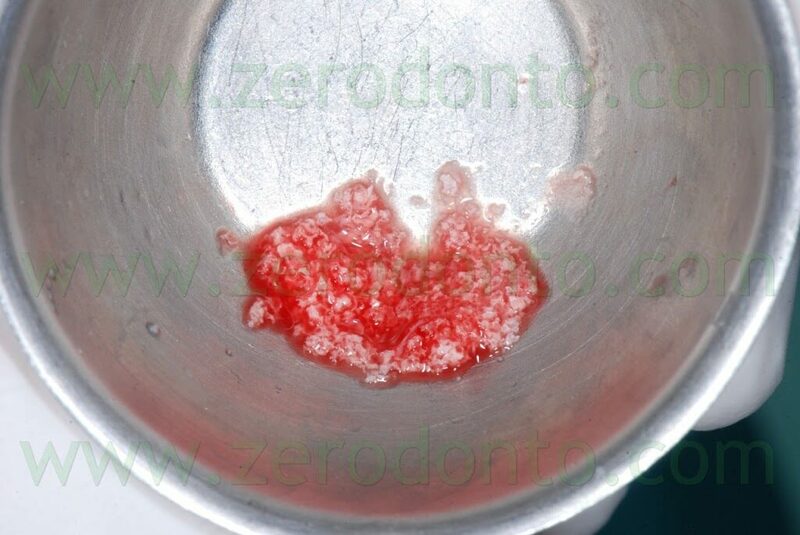 In this case, such an approach was not followed, in order to compare the effectiveness of the Membragel with that of the traditional resorbable collagen membranes, according to the studies by Jung & Hammerle on its biocompatibility in humans. 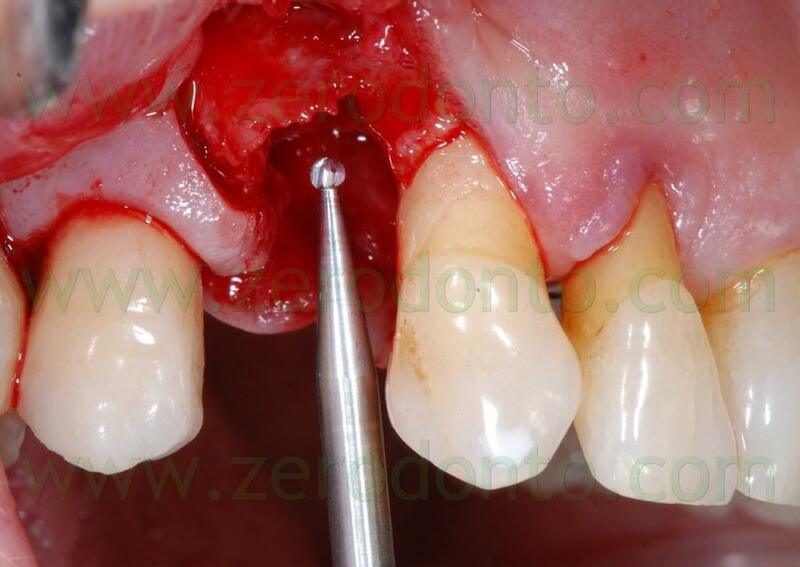 Then, a periosteal cut was made to release the buccal flap. 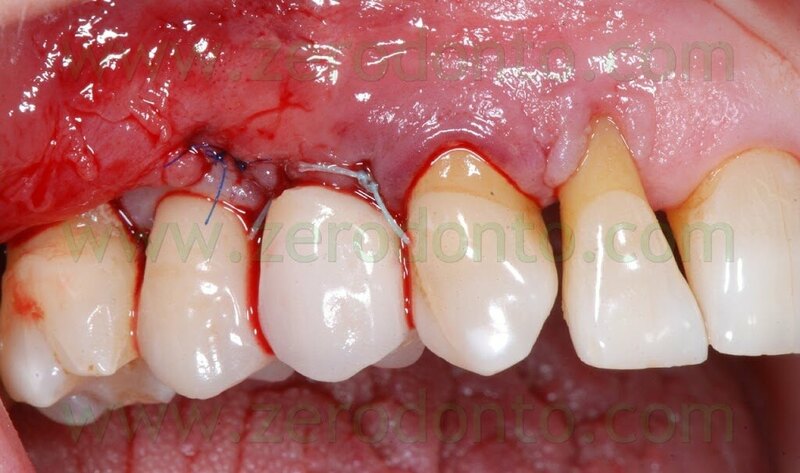 A deep horizontal ePTFE suture (Tevdek 4.0) and a surface 6.0 polyamide suture were used. 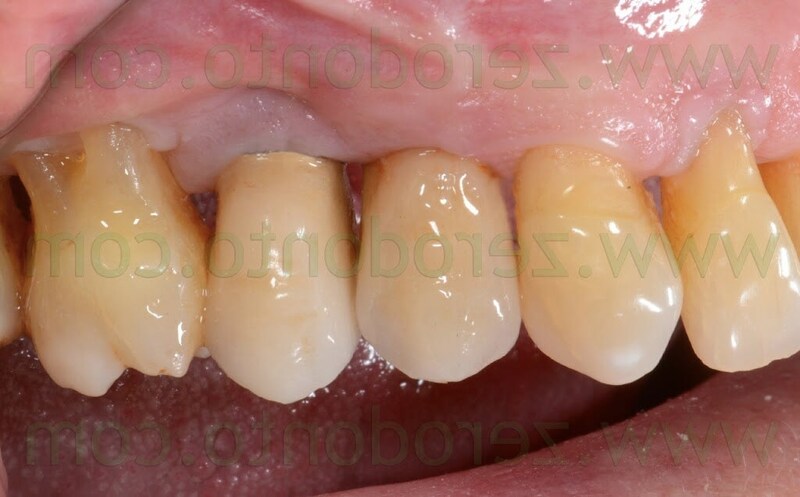 A Maryland temporary restoration was luted to restore proper esthetics. 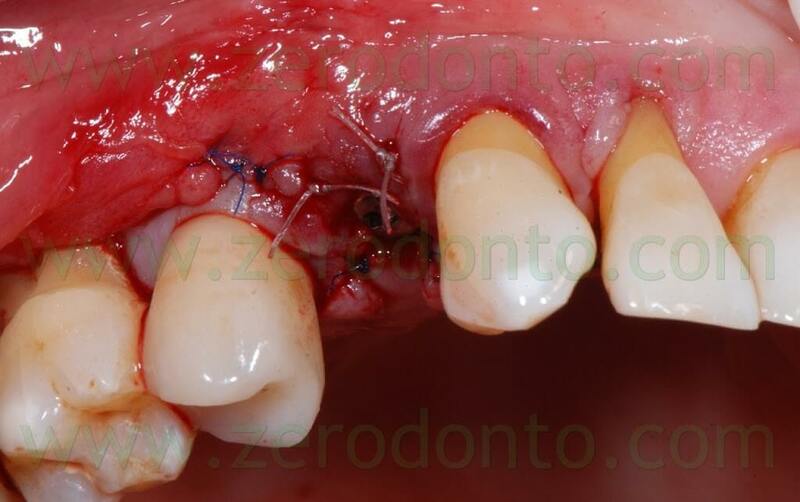 Two weeks after the surgery, the sutures were removed. 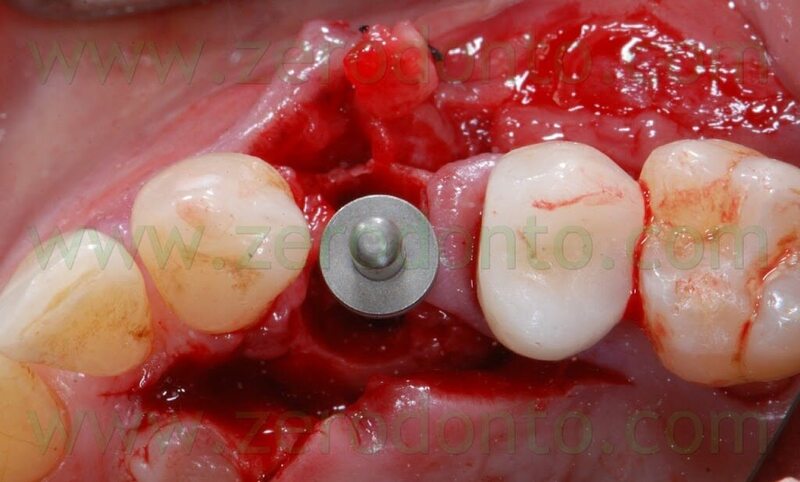 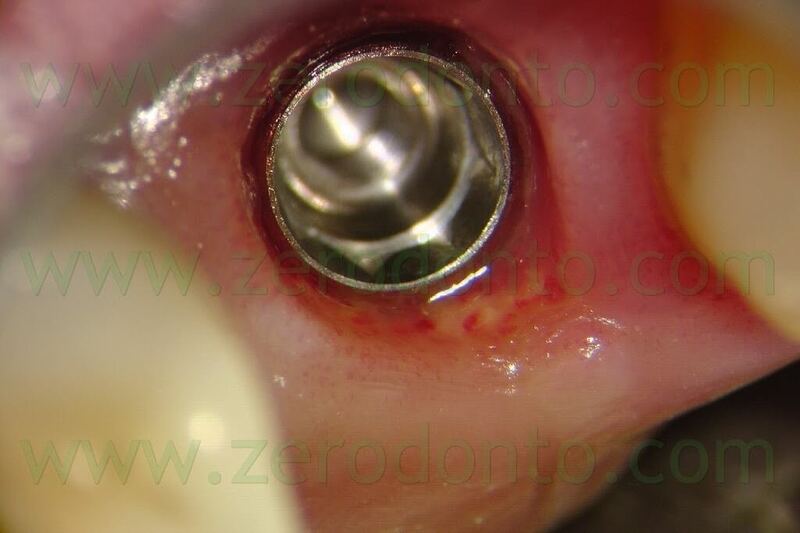 Then, after 3 months, a polyether impression was taken to fabricate a metal-ceramic crown supported by a straigth RN Synocta abutment (5.5 mm). 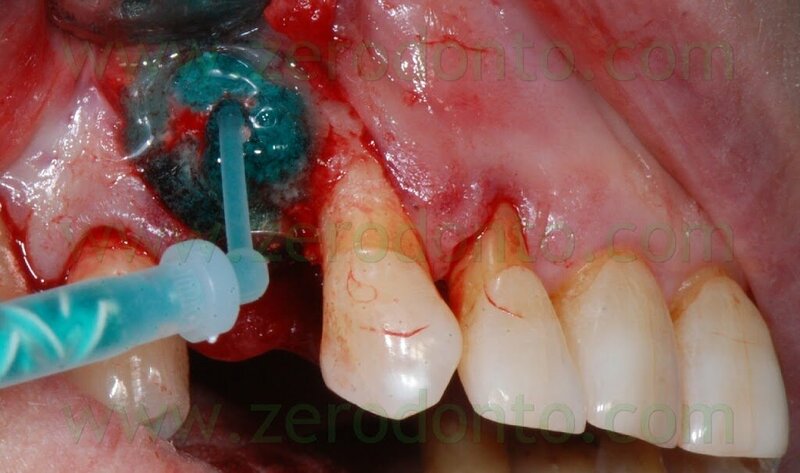 The membrane was found to be user-friendly; nonetheless, a proper clinical training is necessary to use it correctly. 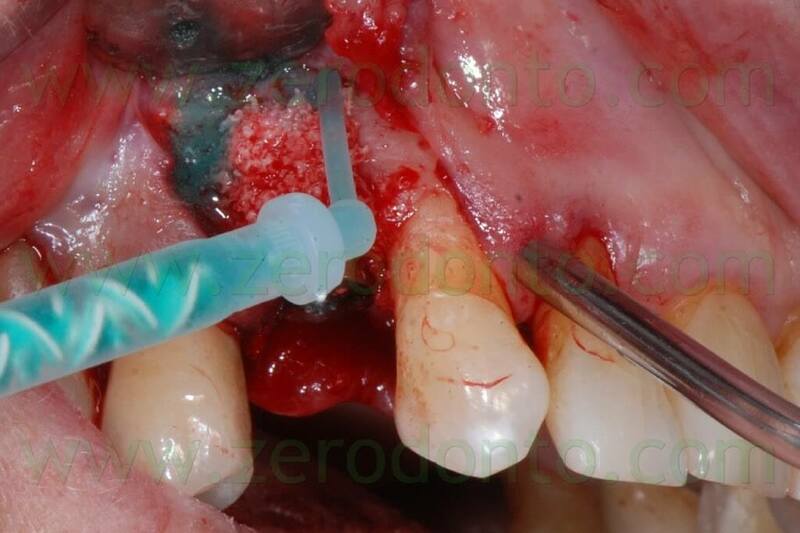 The tissue integration of the Membragel is optimal and several authors reported very good healing with minimal flogosis in case of membrane exposure; consequently, in such an occurrence, its removal is not mandatory. 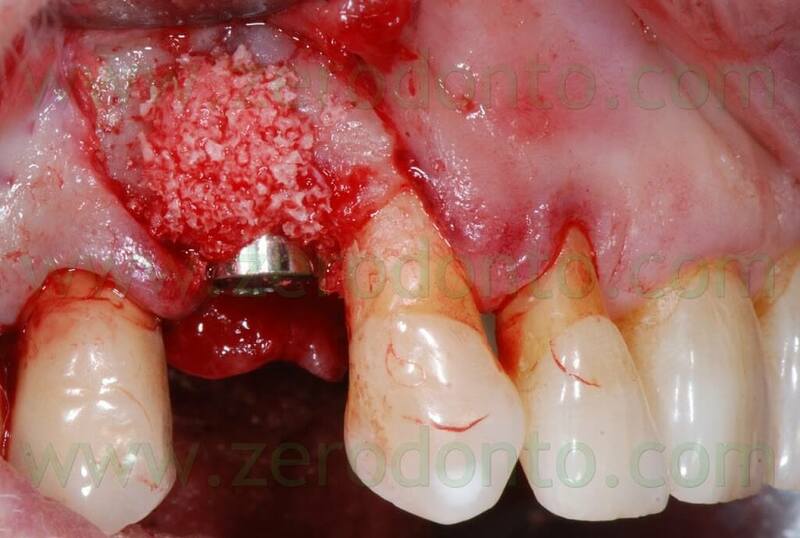 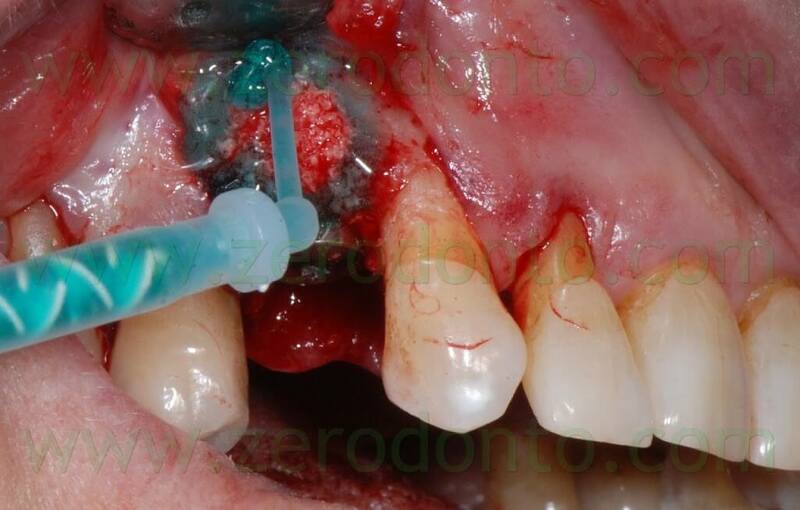 According to the present clinical case, the healing of the Membragel at level of the implant neck remains controversial: for 2 months after the removal of the sutures, little particles of the Membragel were removed form the buccal aspect of the periimplant sulcus. 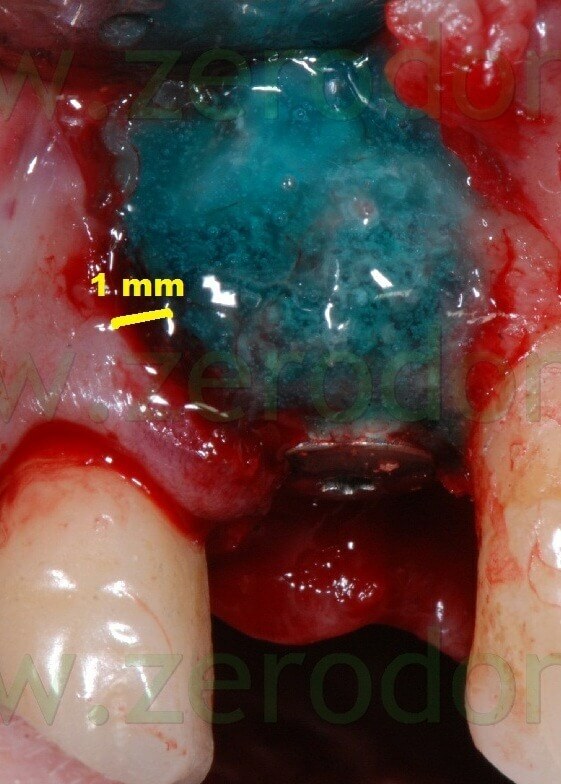 Nonetheless, neither periimplant probing nor tissue inflammation were ever evidenced. 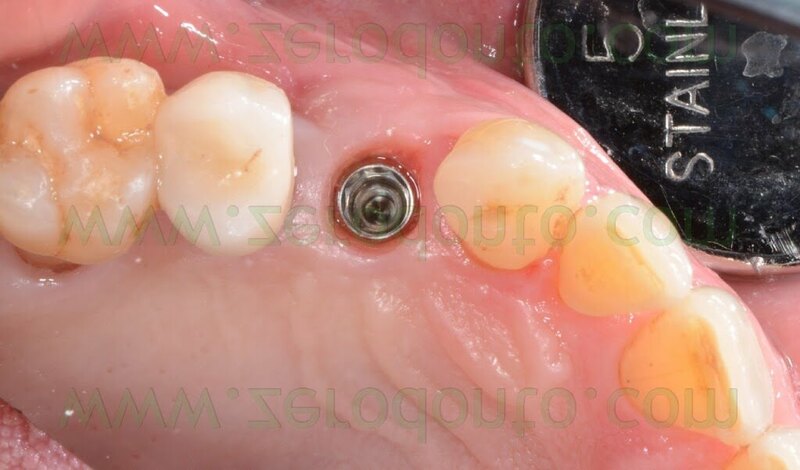 Waiting for further clinical studies, the author agrees with the Straumann clinical guidelines for the Membragel, not recommending its use with non submerged implants.